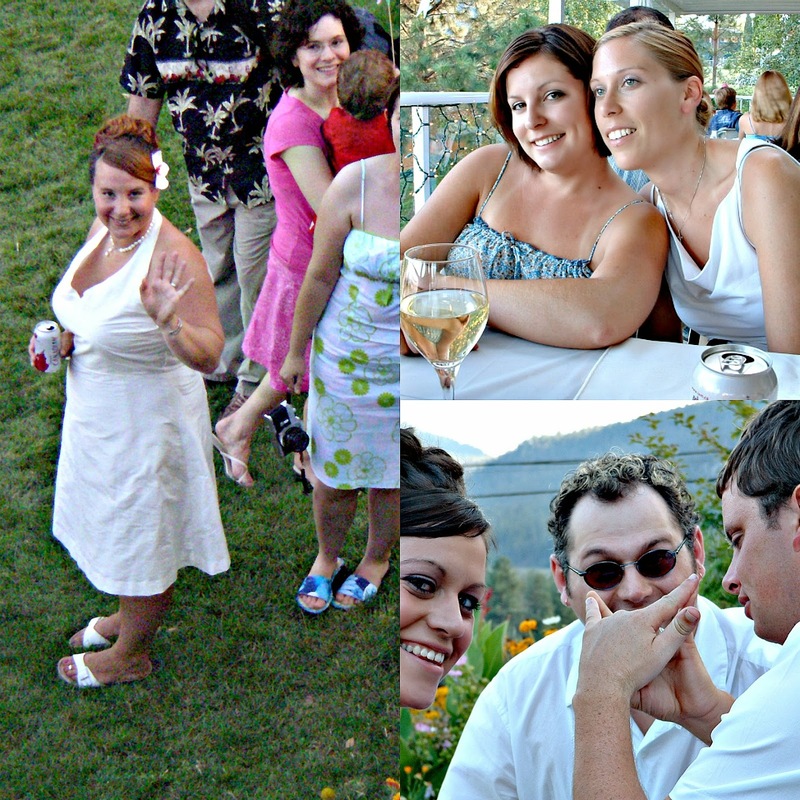 Ten years ago today our family and friends gathered on the grass in my parent's back yard- I hurriedly threw on my wedding dress when I realized it was ten minutes before I was to walk down the isle- I heard you had arrived and poked my head out the patio door and there you were pacing around on the grass. I was nervous but not scared- if there has ever been one thing I was sure of it's you. I knew it from that moment standing on the street in Times Square- I knew it the moment you walked back into my life- it's always been you! So babe heres to ten more wonderful, crazy, frantic, broke assed years- I'm so glad you chose me to be in the fox hole with you! I love you! P.S. Thank you to our parents for all their love and support over the years- thank you to Pia and John for setting an example for us of what it means to be part of a team- thank you to Heather and Kyle for being our closest allies- the children may out number the adults at times but it's nothing we can't handle! Lots of love to you all thank you for being on this journey with us- missing you all immensely today and every day! 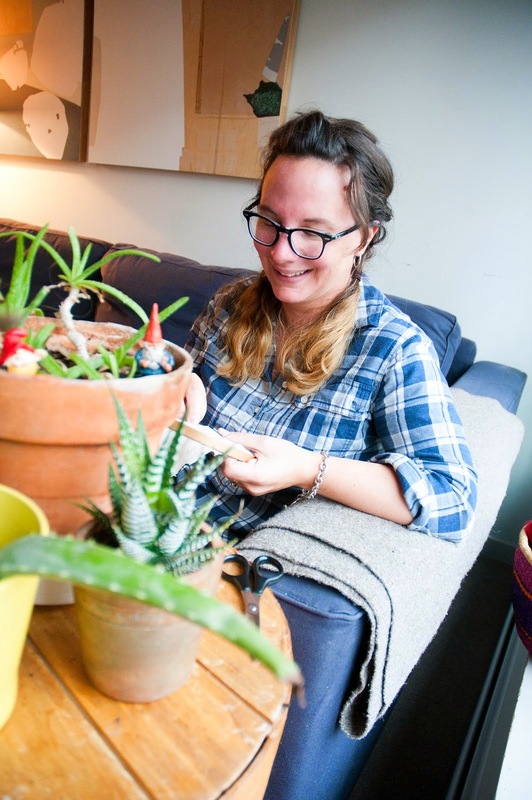 As any work from home Momma worth her salt knows working from home is hard- carving out dedicated time to work and make an income takes conscious effort and determination. This summer I have been so blessed to take my work to places with stellar views- even when it's my own living room like this week- with sick Kiddos- the view is fantastic- because I'm with my kids. It's been really hard though- struggling to find this balance and I'm noticing that there is not really much balance happening most days- it's more of a rhythm- a dance of minutes and hours if you will. 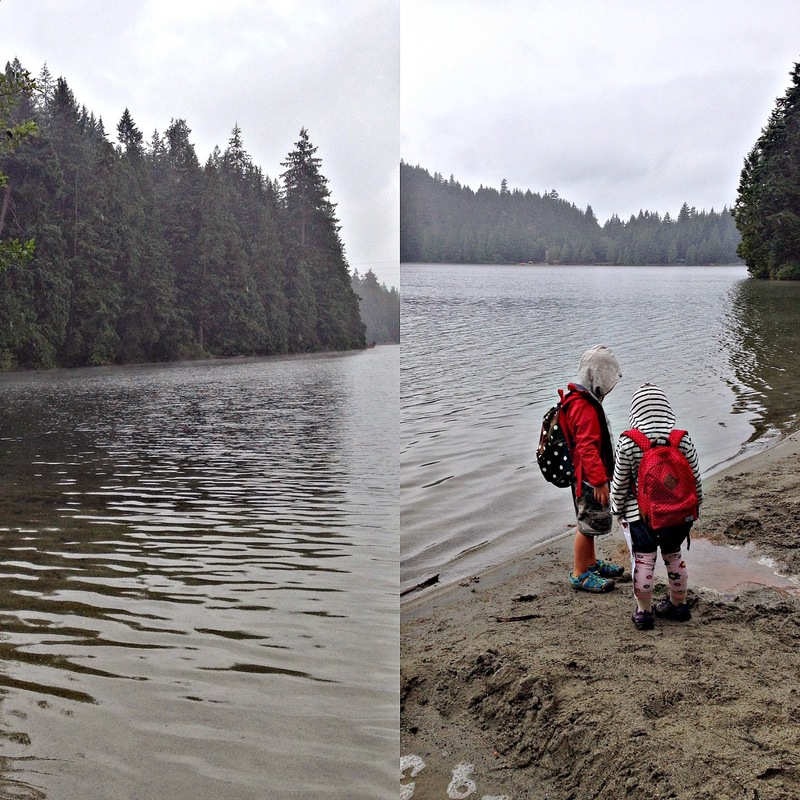 Soon my Littles will both be in full time school- my girly is headed off to Kindergarten- I can't believe that five years have just flown by- it feels like just yesterday I was waddling down 12th street to the Farmer's Market in Kitsilano as a family of three. I have sweaters that are older than my Girl- it feels too soon for her to be going to school- but she will go and I will walk around with a lump in my throat for a month until I get used to it. My days- for the first time in six whole years will be my own to some degree. 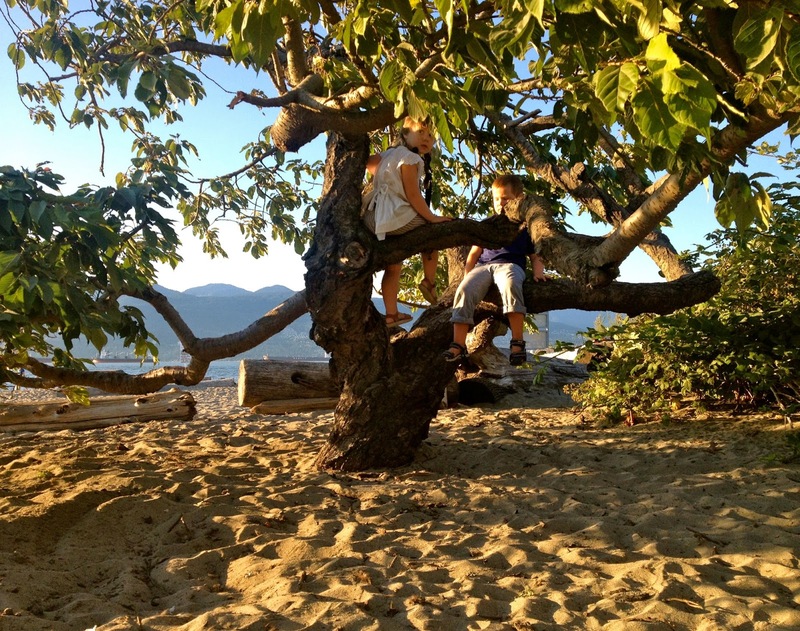 These years with my Littles have been a labour of love- working hard to stay at home with them- being a stay at home Momma in Vancouver is not cheap- we have really missed my steady income. So it is with some trepidation that this September brings change for me as well- I'm looking for a job! Outside of the home! I'm terrified! The last time I wrote a resume was twelve years ago- I got the job and stayed there for almost ten years. I have all sorts trepidations about this job hunt- will I be enough- is my skill set even relevant these days- do companies still want excellent customer service or do they prefer a younger face? Despite these worries I am going forward- because it's the only way to go- we have things we want to do with our life and being broke just doesn't facilitate doing much of anything! I'm still planning to continue to blog- continue Plain Jane Designs because it's my passion- continue to be a present Momma for my family. September I've got my eye on you- seeking big changes and a new rhythm- life is good- change is good- adventure is out there! Last week we had so many of our wonderful friends visiting us from out of town- we always love showing people a slice of our life in Vancouver- we really love being tourists in our own town. We go places we don't normally explore which can be a real treat. With our friends gone- either home or onto the next leg of their vacations- our little apartment was feeling very quiet- we all felt it- so we took the party outside as we tend to do. 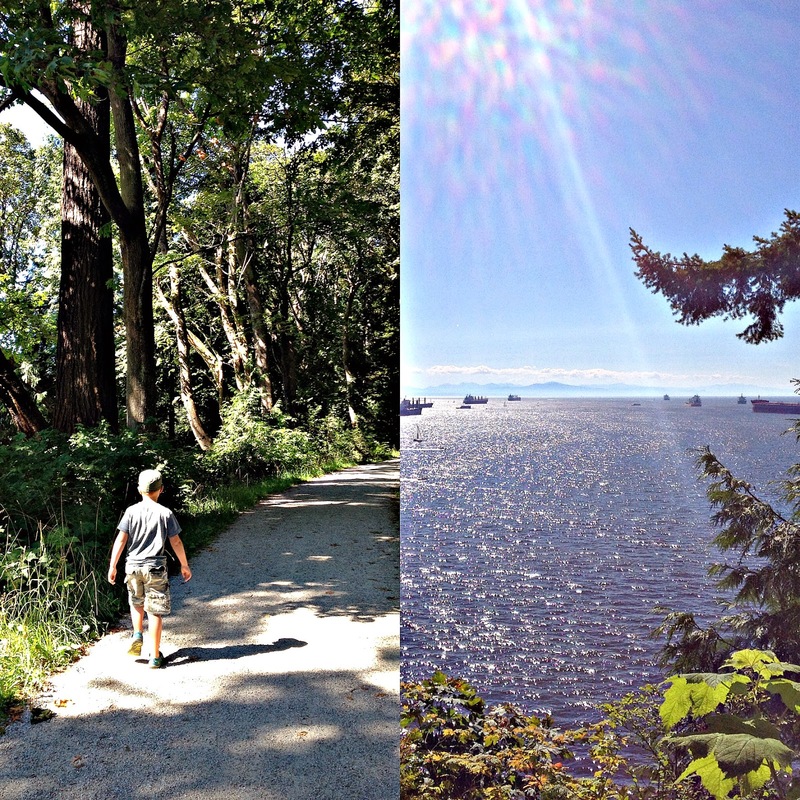 Continuing with the theme of "tourist in our own town" we decided to pay a visit to Stanley Park - we packed a picnic and our swim suits and really truly spent time enjoying the park. We started out with a visit to the newly refurbished Aquarium- the Littles were disappointed that some of their favourite bug displays were gone and the octopus was in hiding. From there we enjoyed a picnic in the shade- relaxing under a canopy of branches and enjoying the cool shade after the pressing crowds of the Aquarium. 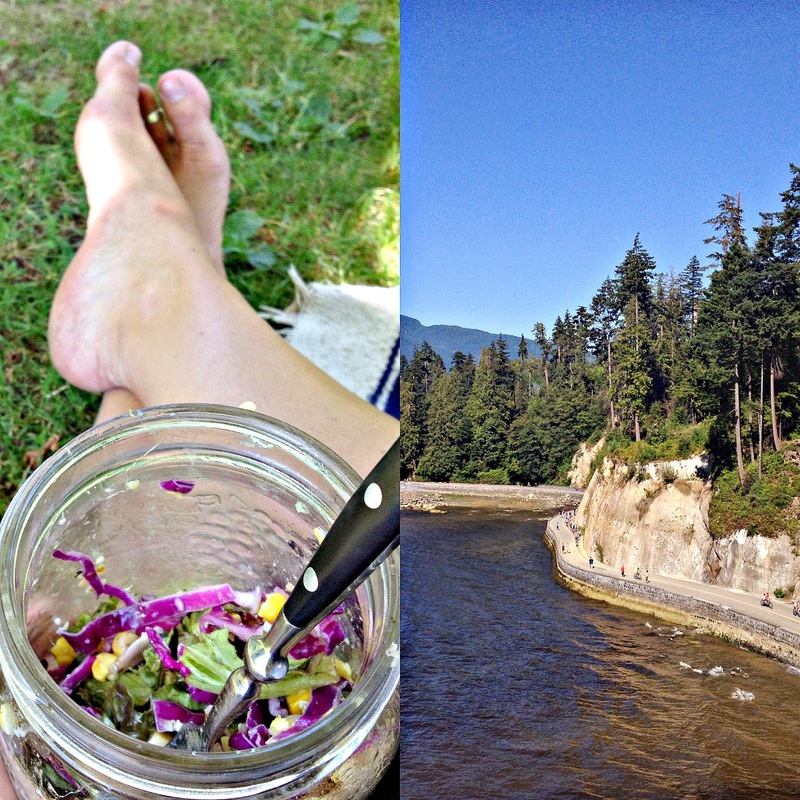 We had no where to go and nothing to do so we truly relaxed into our picnic. 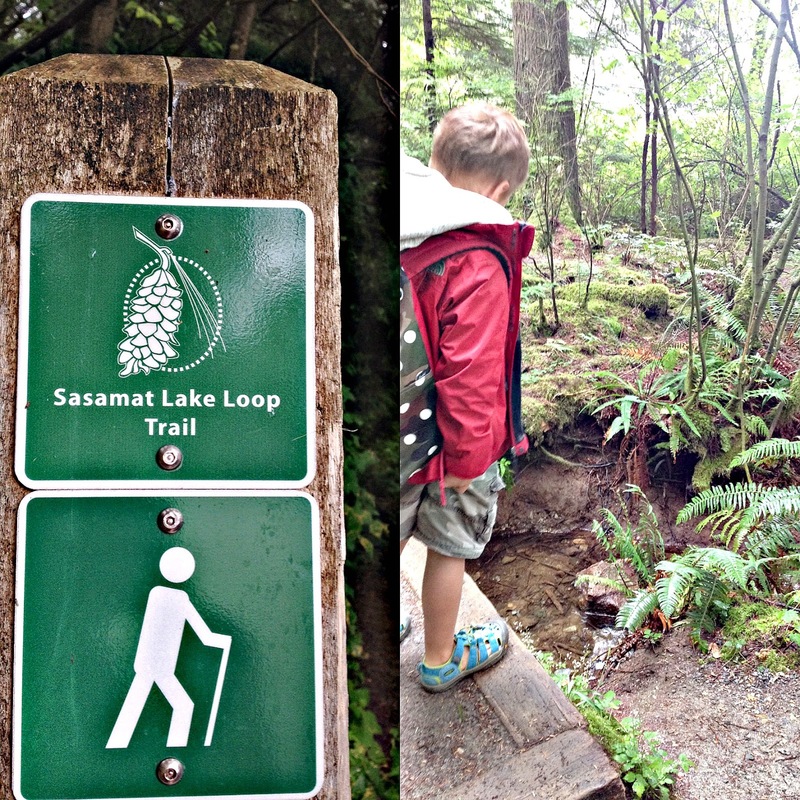 After a quick cool down in the water park we moved onto parts of the park we have never visited with the Littles- we hit the trails and hiked out to view Siwash Rock- which is a stellar part of our coast. 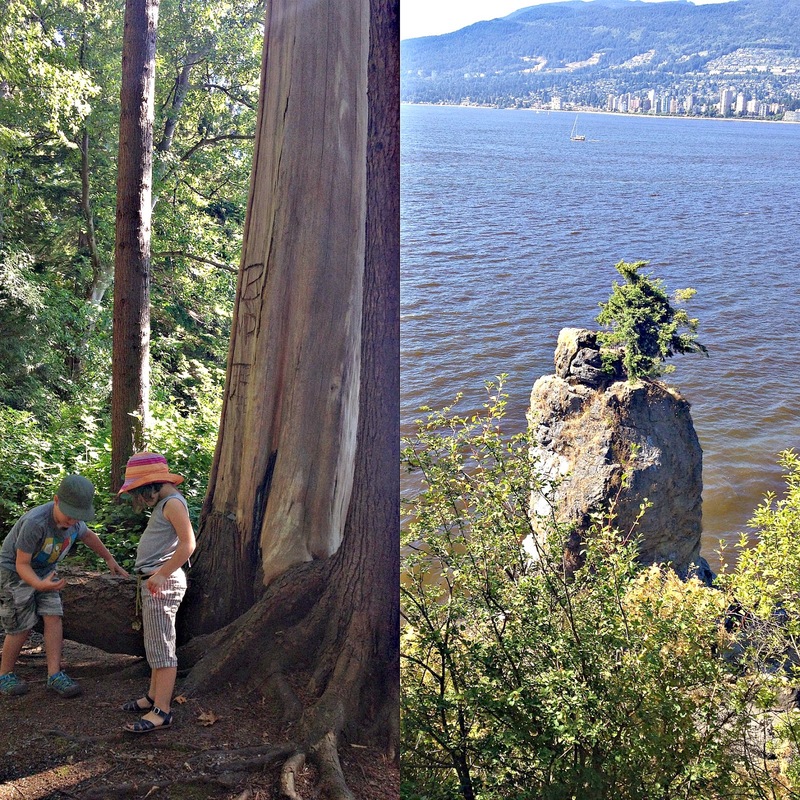 The Littles had lots of explore and look at amongst the ancient trees with trunks so wide even a family of four fails to reach the circumference. One of my favourite things about Stanley Park and in fact Vancouver in general is that regardless of being a major city there are so many hidden pockets of quiet and nature. 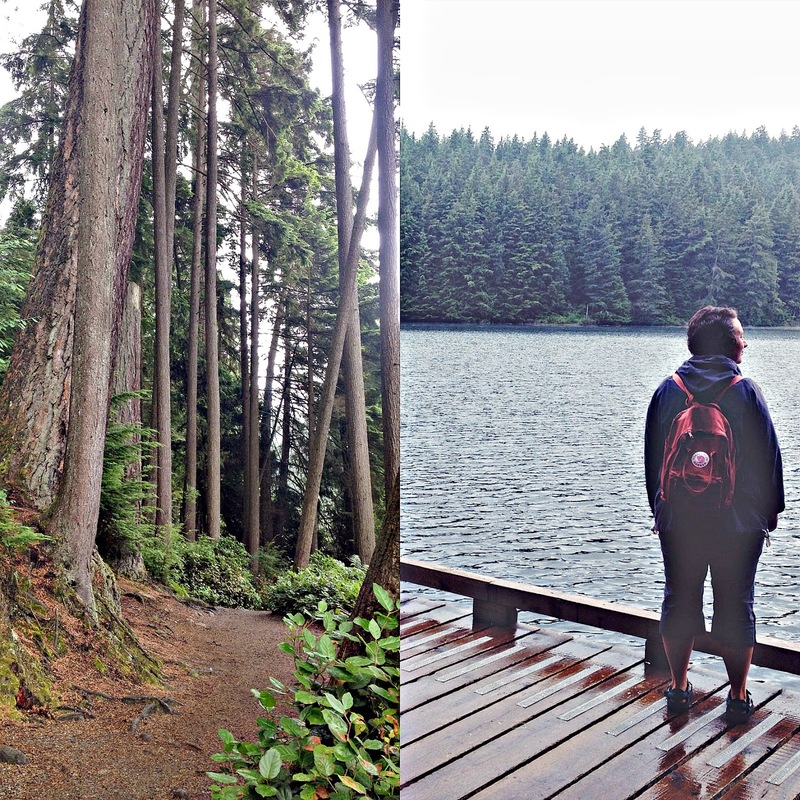 The trails of Stanley Park are cool with few hikers and few bikers- well off the beaten path so to speak- deserted enough to make us forget- if only for an hour- that we aren't in the middle of a busy city. Yesterday was gloomy- we said good by to our friends from California with heavy hearts and waited for the next batch of visitors to arrive from Wisconsin. With the rain pouring down and a bit of time on my hands I decided to bake a cake while we waited. Not just any cake- a Cherry Clafoutis with the end of our Okanagan cherries- picked by my Littles on a hot, hot day not too long ago. -allow to cool and dust with confectioners sugar before serving. 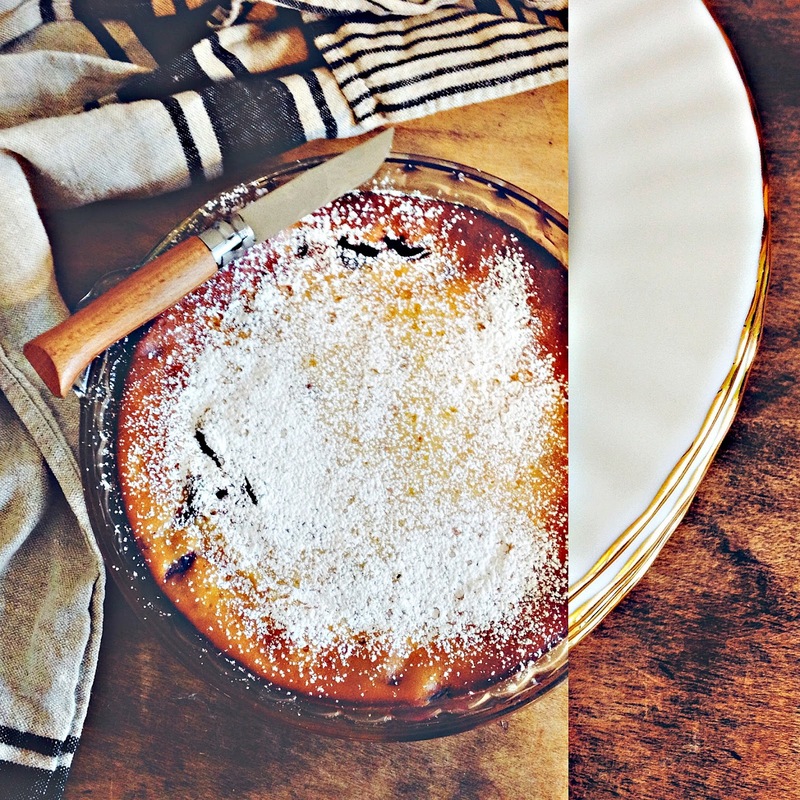 In case you are interested just what a clafoutis actually is the Wicki definition explains that it is a baked French dessert, traditionally with dark cherries, arranged in a buttered dish and covered with a thick flan like batter. Basically it is like a French version of the upside down cake- made with pretty summer fruit an with a more modest amount of sugar. All I know is that this is a delicious and easy dish that I will come back to again and again! Friends it is Friday again- this summer is just flying by! As mentioned we are entertaining visitors from out of town- my chum from University days who I have not seen in quite some time! It goes with out saying that a fair amount of wine and knitting will take place as will multiple trips down memory lane. Happy Friday Friends- hope your weekend is wonderful! This Summer- at our house- has been declared the Summer of reading by the Littles- it's only natural that they catch the reading bug as both The Mr. and I are big readers- some might even call me a book worm. At any given time I usually have at least two or three books on the go- my tastes vary and are fairly all inclusive- I read a lot but am not a literary snob! With the Littles deeply immersed in our regional library's Summer reading program I thought it would be fun to talk about what books I have my nose stuck in right now! Blood, Bones & Butter by Gabrielle Hamilton is an old favourite- I have read this book no less than three times already but still I keep coming back to it again and again. Gabrielle writes about her relationship to food through her journey as a chef- from childhood to the kitchens of France and Greece to the experience of owning her own restaurant. 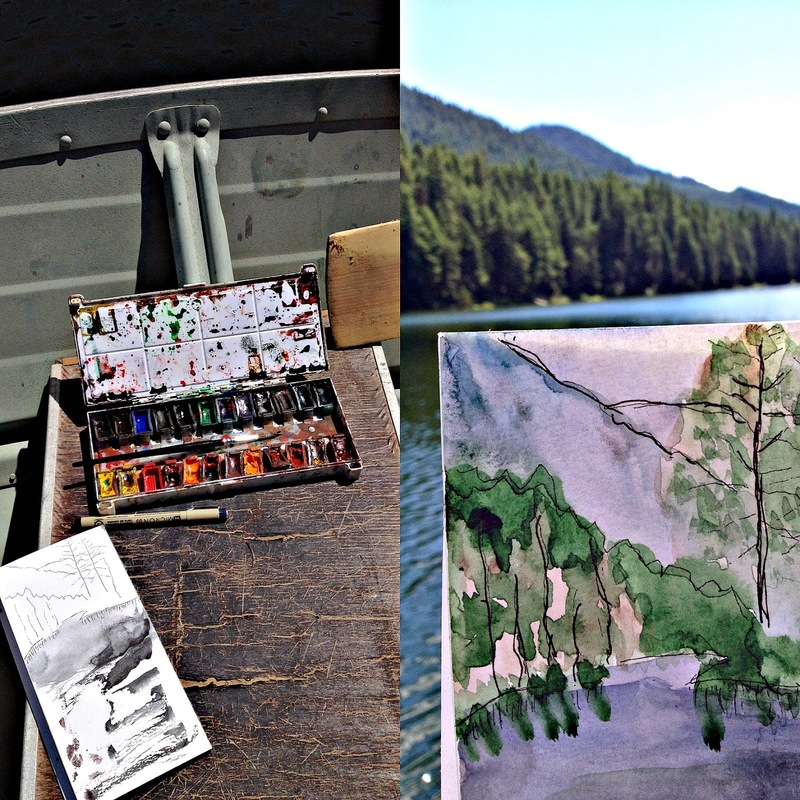 She paints pictures with words of people sitting down to eat- a satisfying experience. Creative Block by The Jealous Curator- Danielle Krysa- this book is an extension of one of my favourite art blogs- interviews, projects and real life advice from 50 contemporary artists- including my friend and artist Jessica Bell! This book is a source of inspiration for days when I need a quick hit of creative block- busting! Made By Hand by Lena Corwin- this is my most recent book purchase- I had been holding out even peeking in this book at Spool Of Thread as I was saving it for the Summer! Full of projects from some of my favourite bloggers and makers this book is full of inspiration! I have already started on the boot sock pattern from Jenny Gordy- hoping they will be done by fall! 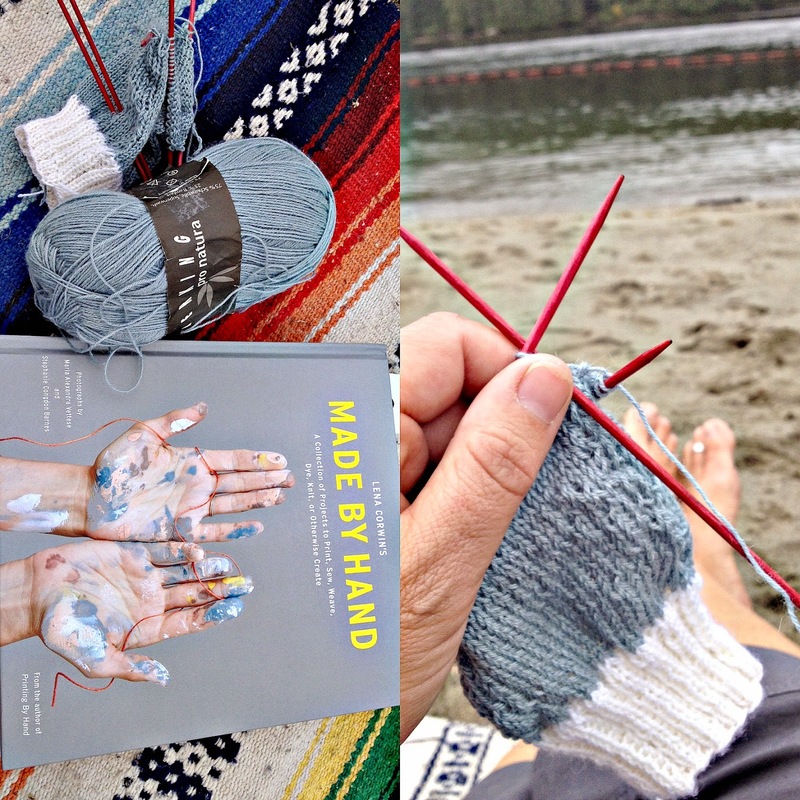 Made By Hand is like Summer Camp- I sat and soaked it all in- cover to cover over our vacation! 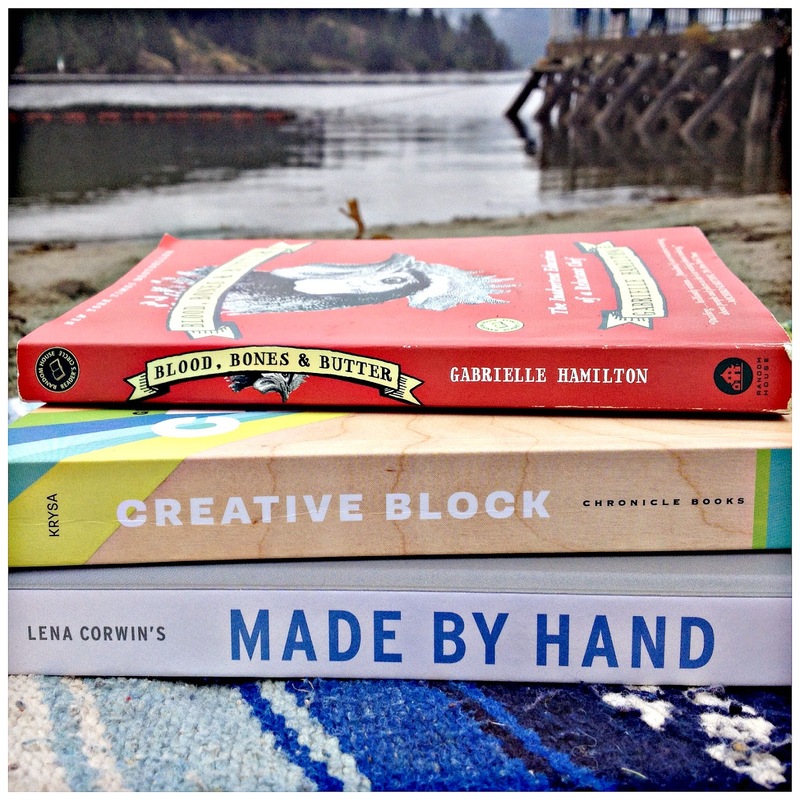 This is what is in my current reading stack- I'm interested dear friends what you are all reading this Summer! Please comment here- I'm always looking for some new book recommendations and I know there are some fellow book worms out there! In extreme contrast to the past couple of weeks we awoke to grey cloudy skies this past weekend- the clouds slung low over the North Shore mountains came as a bit of a relief after weeks of extreme heat. Waking up refreshed from a good night sleep on Sunday morning we decided to head to the forest and trails around Sasamat Lake- out past Anmore near Port Moody British Columbia. Our little family lived in Port Moody for a year- trying the whole suburban thing- we haven't visited this beautiful place since we moved back downtown three and a half years ago. The last time we walked these trails Miss Lo was a wee- tiny babe- all cuddled up in the Ergo and The Boy was much shorter but equally curious about the world. It was with a bit of nostalgia for this young family that we re-traced our steps and ventured further beyond- bigger and even more inquisitive kids hiking independently. 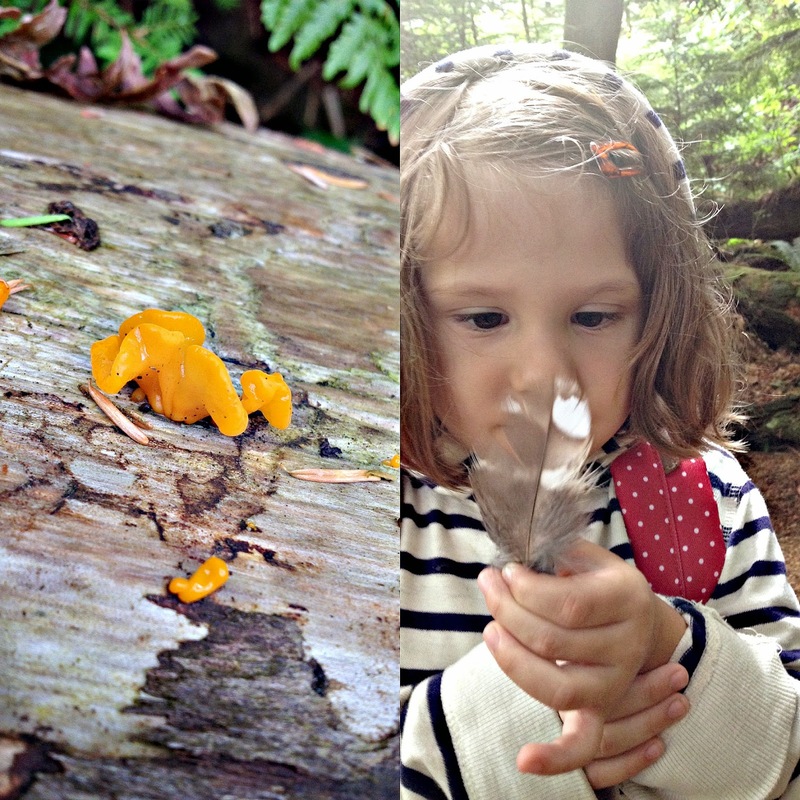 The day was full of bird watching, fungus spotting and learning all about nurse trees- spotting and identifying each item as we went. All agreed it was a perfect day- so quiet and peaceful- the cool wind on our faces- a light drizzle on our shoulders. This is exactly what we had all been needing - a respite from the heat- we are indeed a real West Coast family- operating better in cooler weather. Days like this fill me up for the week- sitting here on Monday morning- easing into another sunny day- looking at these memories from yesterday I am reminded of the beauty that surrounds us and how lucky we are to live here. This morning we are waking up to news of a large forest fire burning out of control in our beloved Okanagan valley- it hits very close to home with some of our dear friends being on evacuation alert and family members actually being evacuated from their home. Our hearts are breaking watching this place burn on the news- a feeling of hopelessness has descended- there is nothing anyone can do but watch. 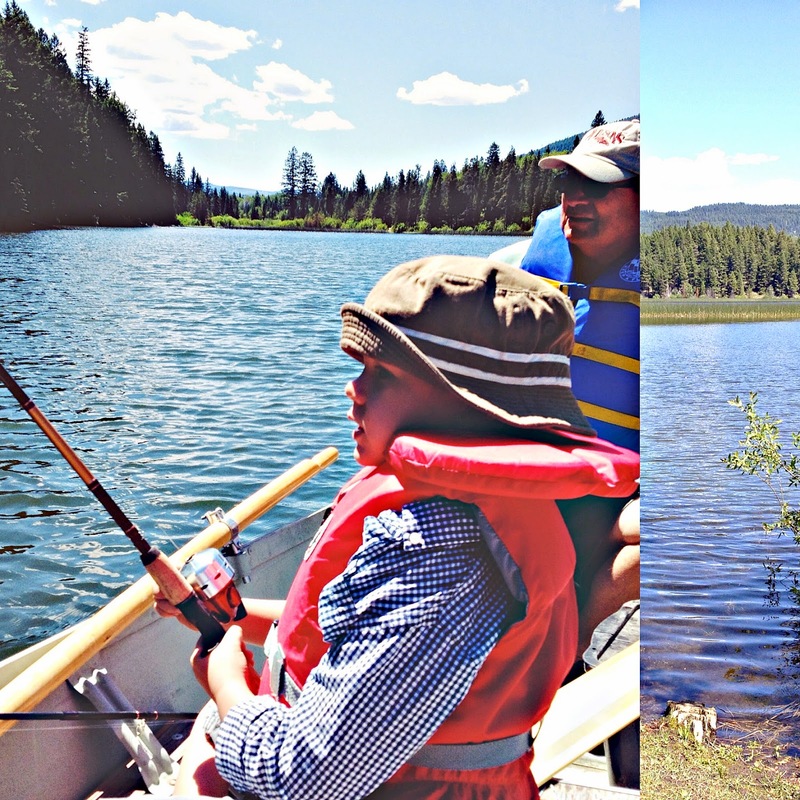 This time last week we were still there with our family enjoying everything the Okanagan has to offer- including a trip to the back country with my Dad to go fishing on one of the many small lakes that dot the mountains. When we were out there it was very evident that conditions were tinder dry- when we were out there we also noticed many incidents of human carelessness including lots of garbage. This place is beautiful and special and yet people feel they can't be bothered to pick up beer cans and fishing wire. On the day we went the skies were clear and blue- the mosquitos and black flies buzzed thick around our faces -as did the dragon flies on the water and in the reeds. The Boy was equally excited about riding in Poppa's truck as he was to be going fishing- excited to get to sit up front and up high- he was excited about the roadies* Poppa brought along- he was just excited about pretty much everything! While the Gents got down to the business of fishing- the teaching and learning of casting- I settled into my spot at the bow of the boat- in charge of the anchor and catching a few rays. My idea of fishing is slightly different than theirs- it was so quiet with no other people around- the wind and the water were almost the same temperature. 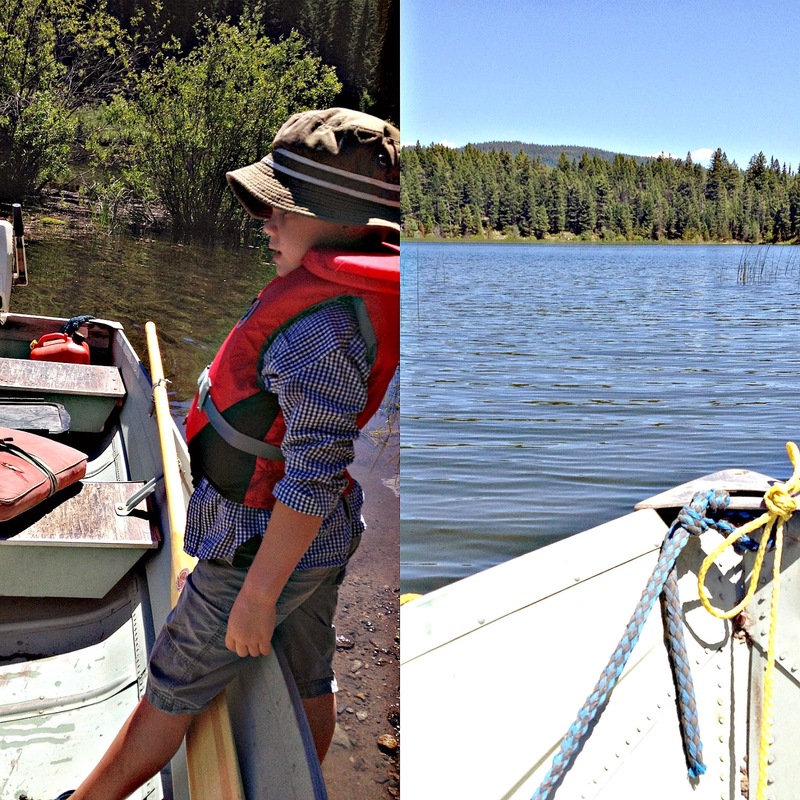 This is how my sister and I grew up- being dragged along to all these fishing holes by or parents- thick with bugs and heat and not many fish. Long ago I learned it isn't about the actual catching of fish- which is nice- but about the quiet- the escape from daily routine- escape from a hot house. This landscape holds my heart and it always will- I am so happy that we were able to spend such a beautiful day at this beautiful lake while the skies were still clear! Dear Friends it is Friday again- this summer is just flying by- if you need me this weekend you can find me and my friend- fine boxed wine- basking out on our deck. After weeks of travel we are going to take it easy and stick pretty close to home. 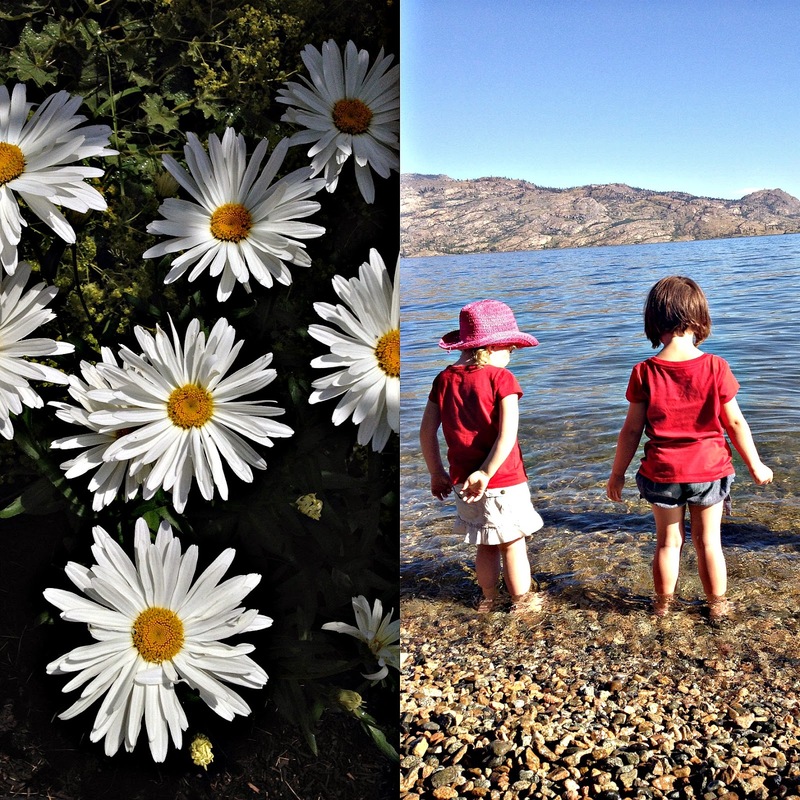 Thinking of our family and friends in West Kelowna today- much love and peace. The hot weather arrived a couple of weeks ago and with it my panic in regards to my wardrobe- here's the deal- over the past year I have just been wearing out my clothes and not really replacing them- a novel approach these days perhaps. Since becoming more aware of fast fashion and how it relates to the environment I pretty much put a halt to any new buying- home sewn garments yes, sustainably made garments yes, vintage and second hand yes. When building a wardrobe becomes more like a scavenger hunt what often happens is that large holes appear in one's closet- this was the case regarding my summer items. I had very few warm weather items going into this heat wave and so walking down Pender one day I decided to stop into the new consignment shop Hunter & Hare to see what all the fuss is about. Hunter & Hare is a gorgeously well curated shop- full of good quality, fashionable items as well as a nice selection of locally made goodies- candles, soaps,totes and accessories- lots of lovely bobbles! I found a few things I liked and as I was chatting with the gal at the till I noticed a wee bit of lace peeking out the bottom of a stack of clothing on a chair- items not yet out on the floor. 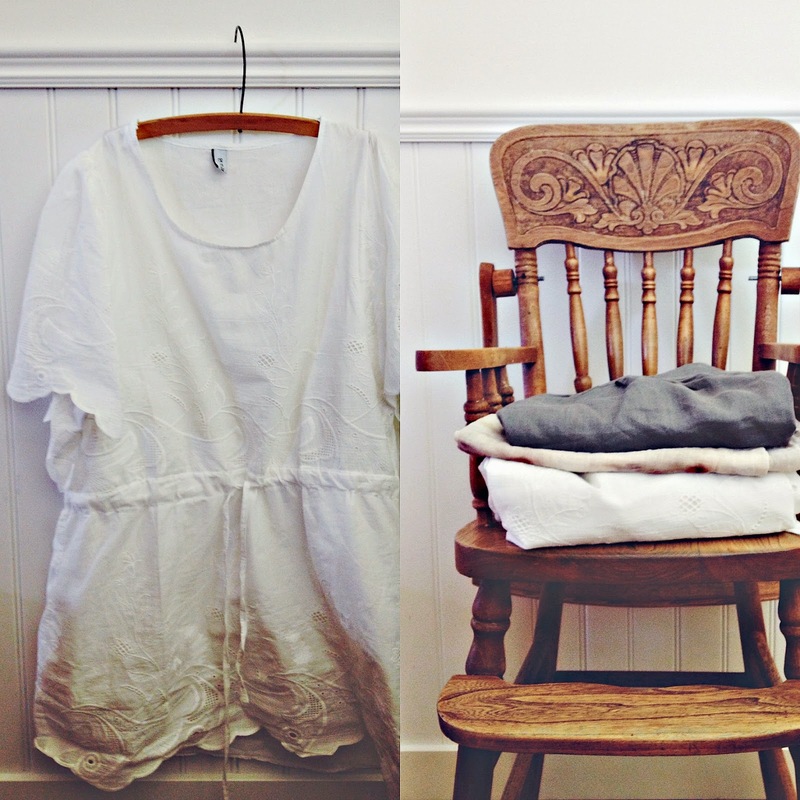 The sales girl was gracious enough to pull this lovely white smock out and I added it my take home pile immediately- I'm a sucker for white in the summer! This is what I love about thrifting or vintage shopping- you go with a general idea of what you need or want (because the two are not mutually exclusive) and magic happens! I'm so happy to have discovered yet another well appointed consignment shop in my neighbourhood- it makes life and my wardrobe so much more interesting! 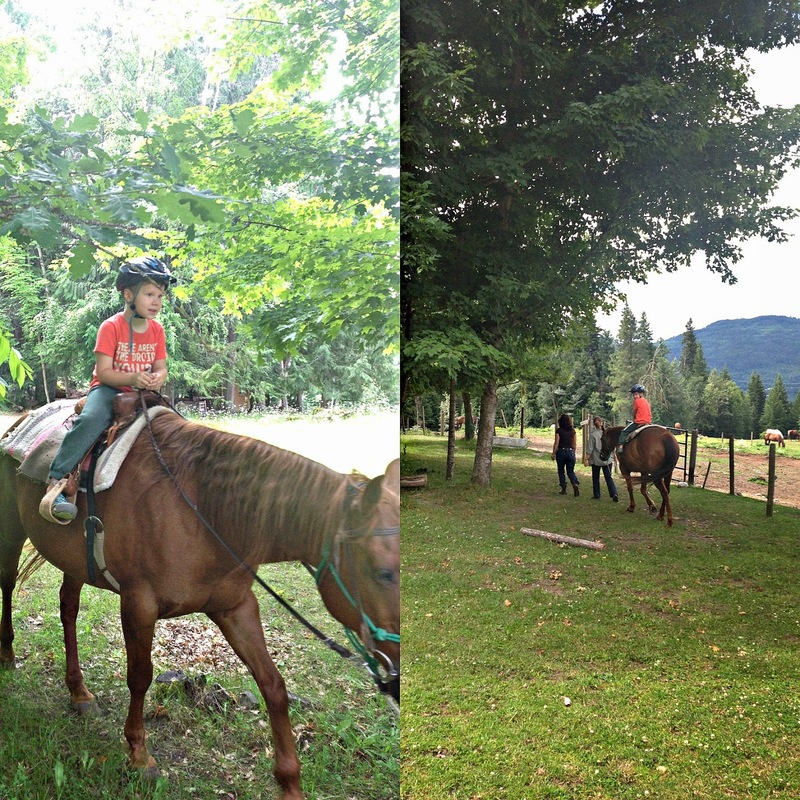 Last week- while still on our Okanagan vacation- my Father In Law came to us with one of his plans- he had booked the Littles their very first riding lesson. 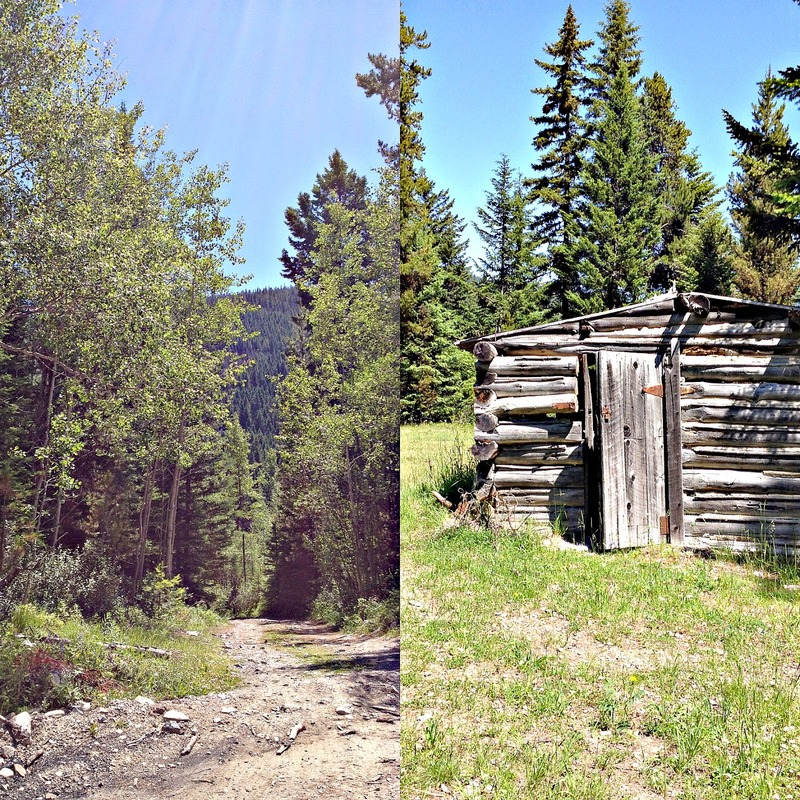 So we packed up snacks an headed out past Lumby towards Mable Lake to Silver Spurs Trails- a slice of paradise just outside the city! 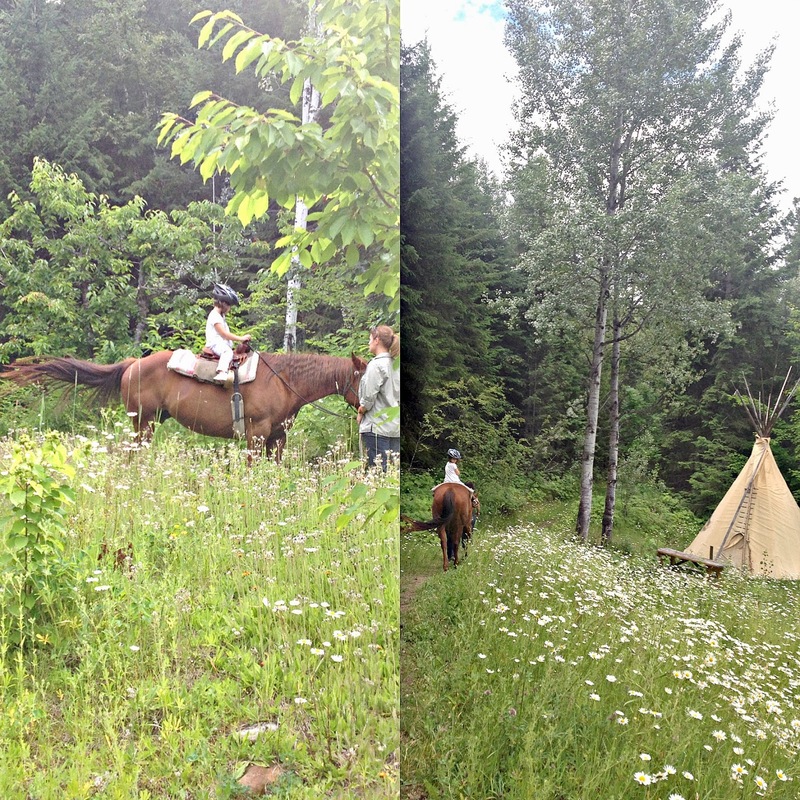 Silver Spurs is a full on working Dude ranch- the property includes two tee pees which can be rented out for a weekend or a week. Other activities- besides horses- include hiking, fishing and in the winter snow shoeing through the pristine wilderness of the BC back country. Upon arrival the Littles were introduced to Starling- the ranch's quietest and easiest horse- they were shown how to say hello- brushed her coat and then learned about putting the blanket and saddle on. 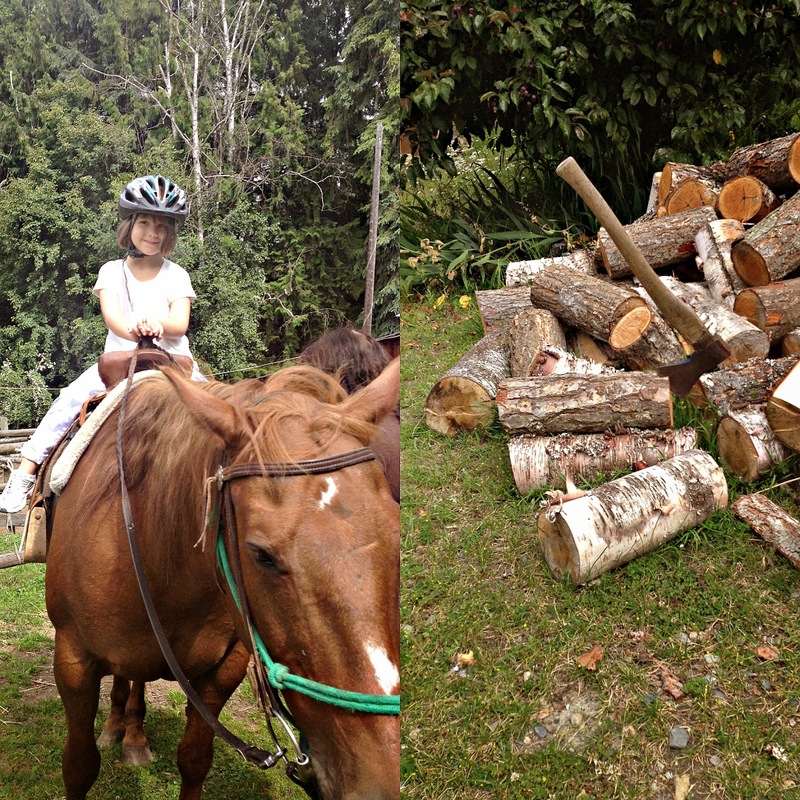 This very gradual introduction to the horse helped the kids get comfortable around the big animal- when the time came to go for their first ride both kids were relaxed and excited at the same time. The staff were so in tuned with the horses and engaged in what they were doing that it naturally drew the kids in and got them interested- although The Boy might have been more interested in the barn cats! As much as I was watching my kids I also had an eye on my Father In Law- in his youth he worked extensively with horses- in Germany he was an Olympic Equestrian rider- so it was only natural that he was having a really proud Opa moment watching his kids take their first ride. 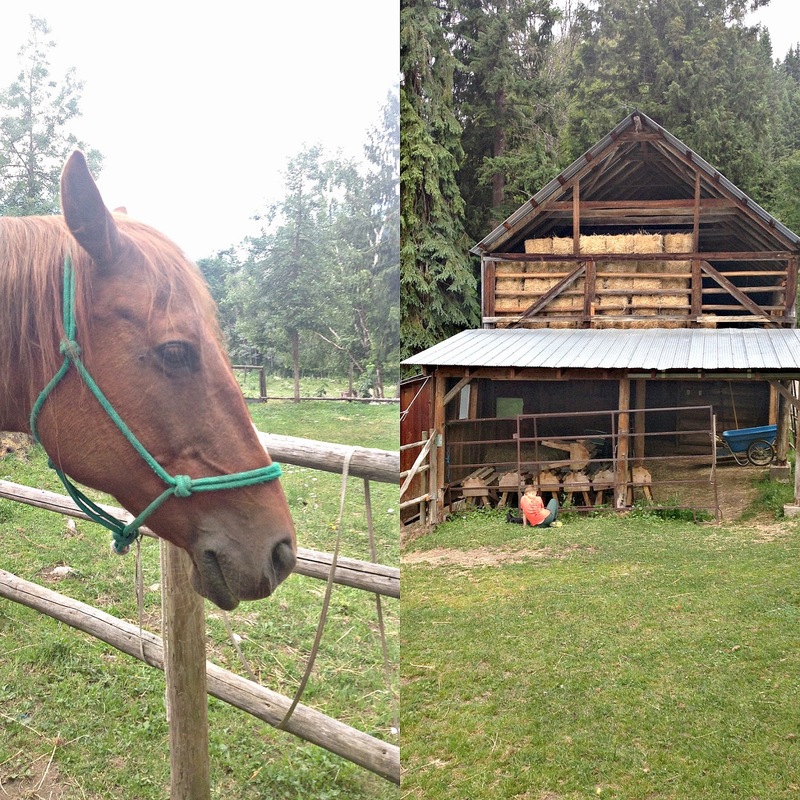 Both kids were so blown away by being up on the horse- they really loved everything about the ranch though- from the ranch dog Trapper to helping feed the other horses and pick cherries! 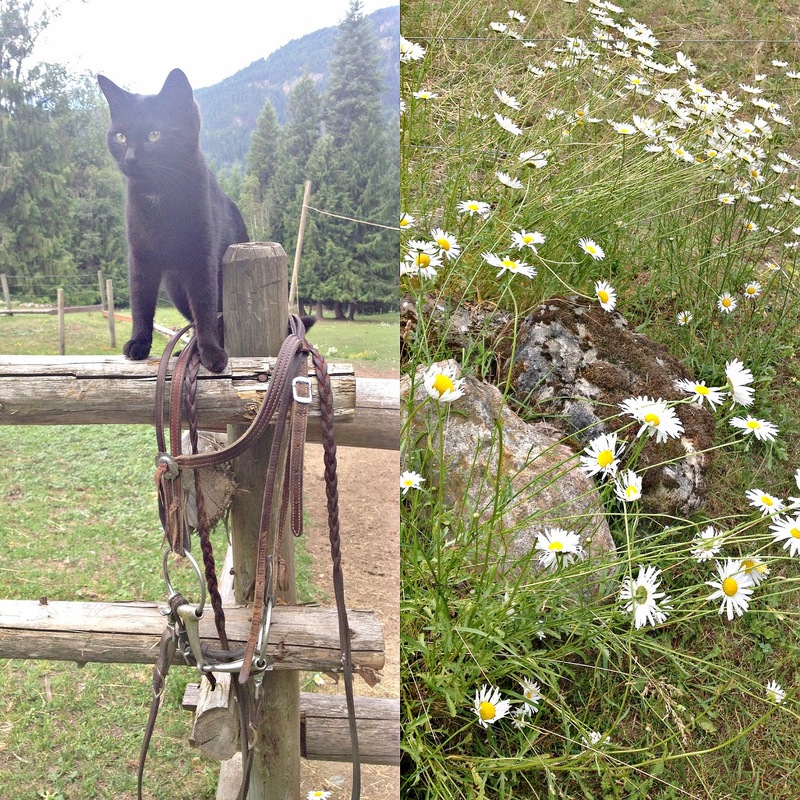 Silver Spurs is such a beautiful spot- fields of daisies surround the property- making everything all the more magical. 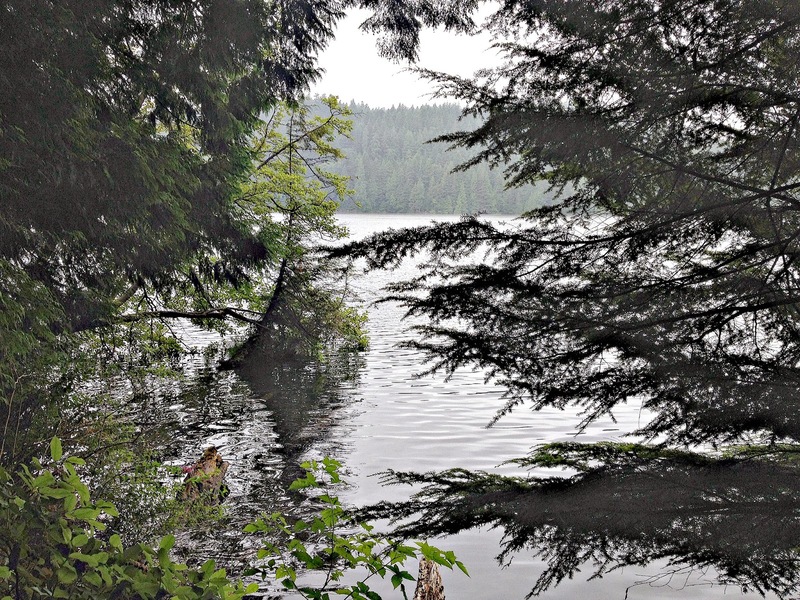 Surrounded by mountains and close to Mable Lake this would be the ideal spot for a family getaway. The Boy has requested we return and stay in the tee pees and Miss Lo wants to visit her friend Starling again. no means a waste of time"
There is something so special about the perfect sundress- lightweight and not stiff at all- moves in the breeze- dreamy and cool. Today's Thrifted Thursday is just that- although technically not thrifted at all-but vintage- bought from an Insta-seller on Instagram- my favourite @bonjourmoon! 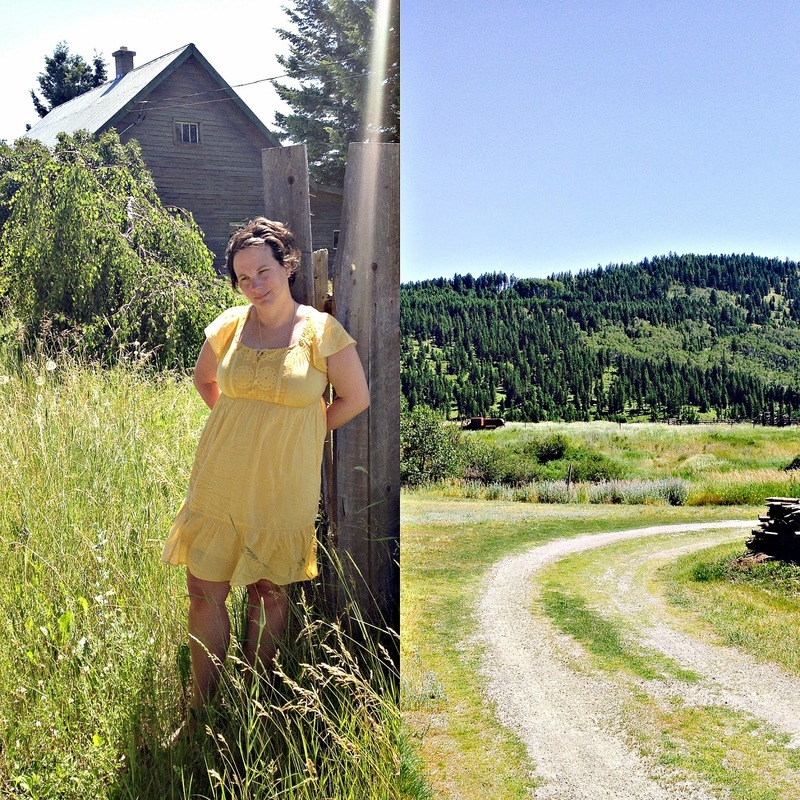 This sweet little gauzy dress is just what I needed for my visit to the Okanagan and it arrived on my parent's doorstep with excellent timing. It was the perfect, lightweight dress for heading South down Hwy 97- into the desert yesterday! The Mr. was gathering shots for a project he is on at work and so our entire family of course went along for the ride- excellent sandwiches were procured by my Dad from Il Vechio's in Penticton- to be enjoyed later on in the warm shade at Nk'Mip winery. We caravanned down the valley- enjoying the scenery and taking note of all the various wineries we would like to come back and visit- Blasted Church I'm looking at you! 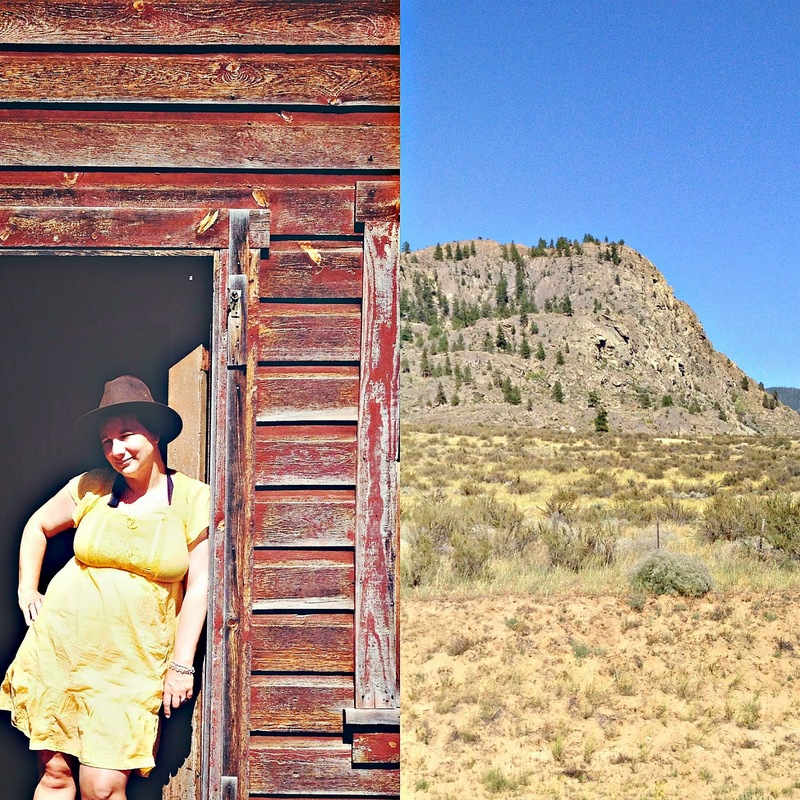 After exploring up Anarchist Mountain to Bridesville- Population 30- we headed back down to Osoyoos for a dip in the lake- always the warmest lake in the valley thanks to it's super shallow depths. 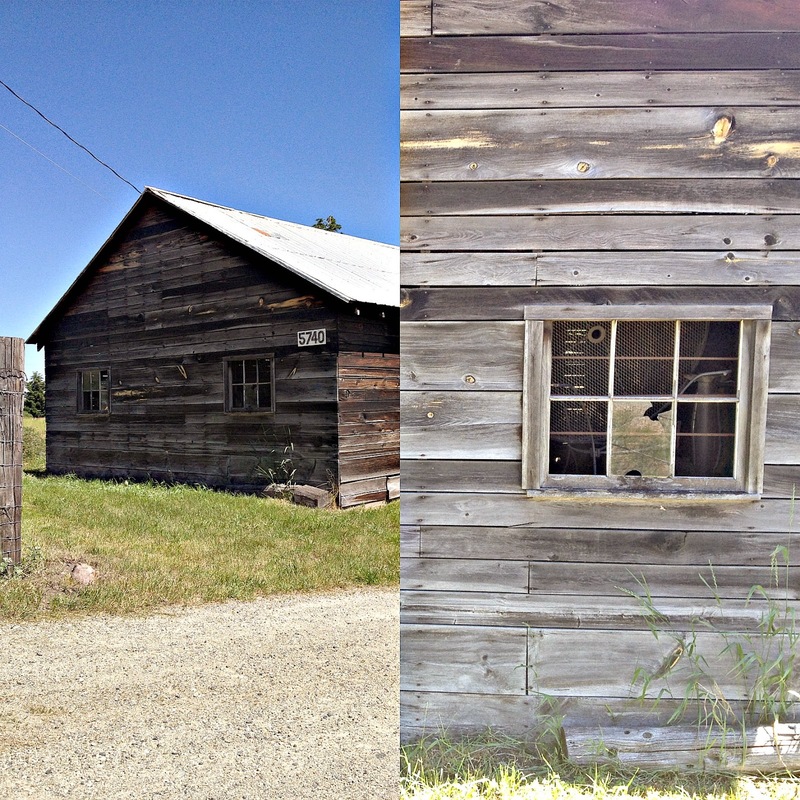 A few more stops along the way to get interesting shots- including the old Hayne's Ranch in Osoyoos- which was amazing. Smart footwear is called for in places like this- not Birkenstocks like I was sporting- after stepping on a few cactus I decided to take my chance with the spiders and headed for higher ground. 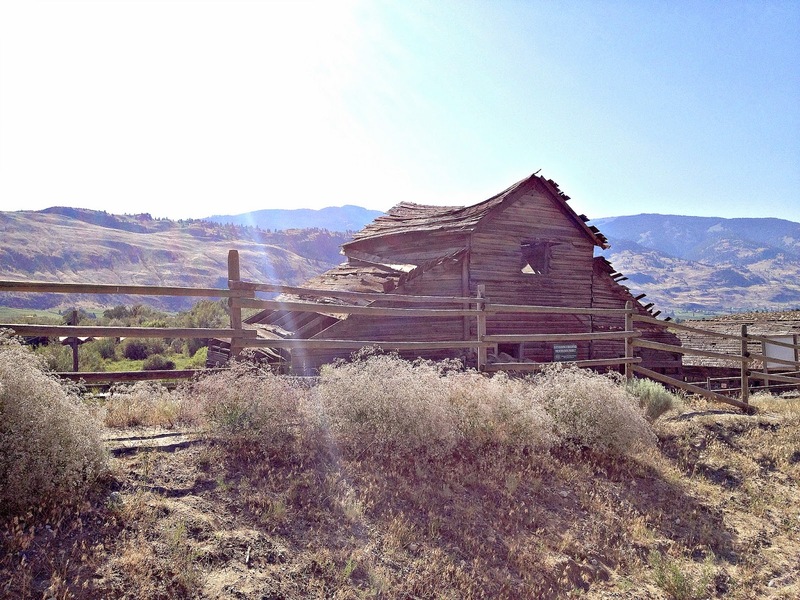 This ramshackle old farmhouse was once the home to the "Father of Osoyoos" and his family- sadly left to the elements- what once was a beautiful family home is now returning to the earth. As the Mr. wrapped up his photo shoot I sat and just watched the landscape in front of me- barren hills covered in scrub brush transitioning into verdant orchards and vineyards- truly a testament to the pioneers who carved out a life in this valley- turning it from desert to irrigated paradise. 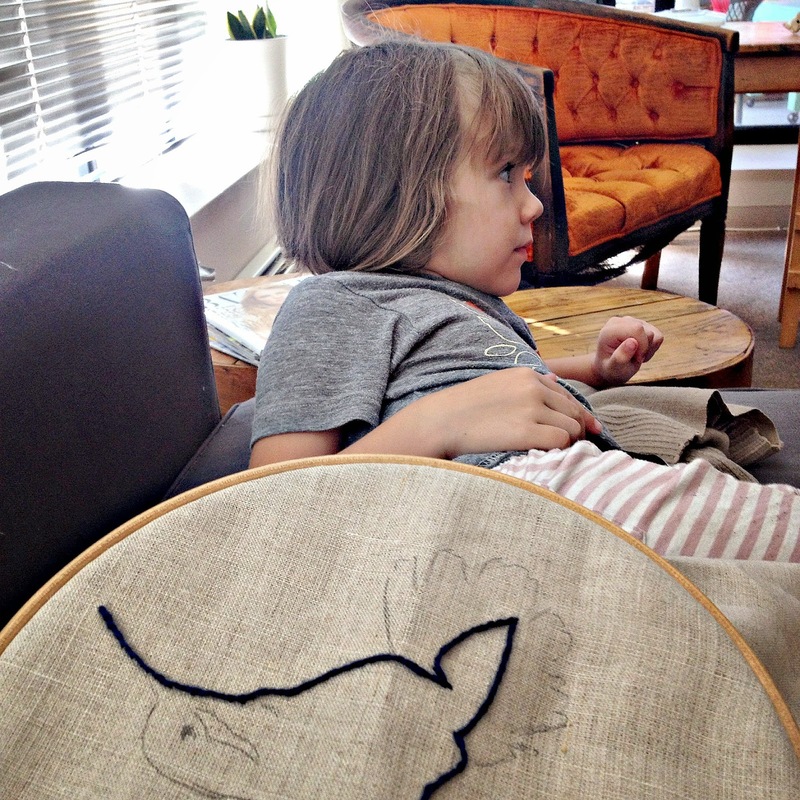 This week's studio update can be considered the Holiday edition- because I am still on vacation but find it difficult to sit still! 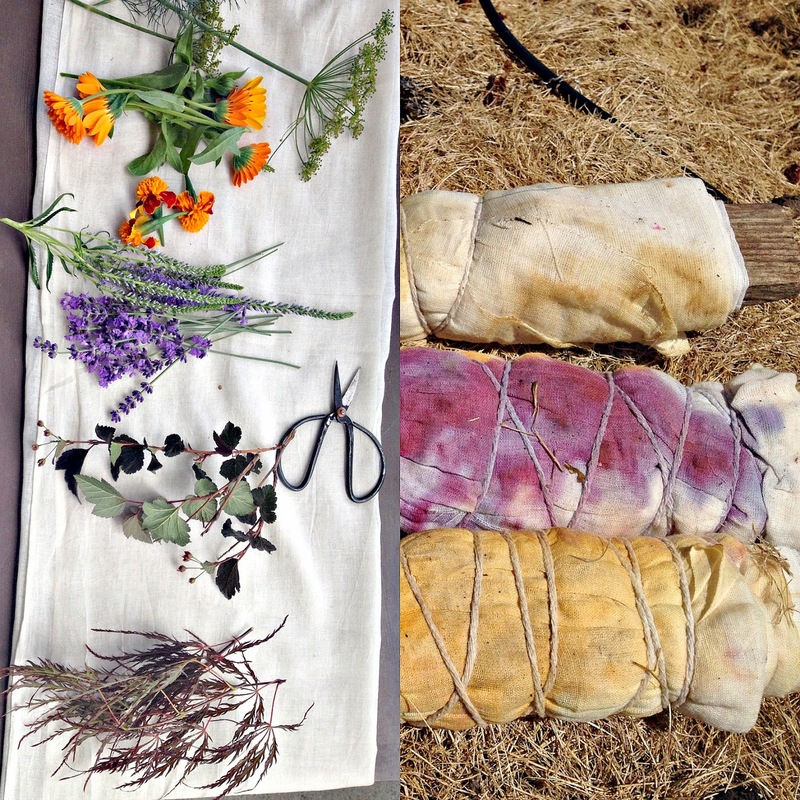 This week I tried my hand at something I have wanted to do for a very long time- Eco-bundling- essentially using plant materials on hand and wrapping them up to leave out in the garden to do their business. 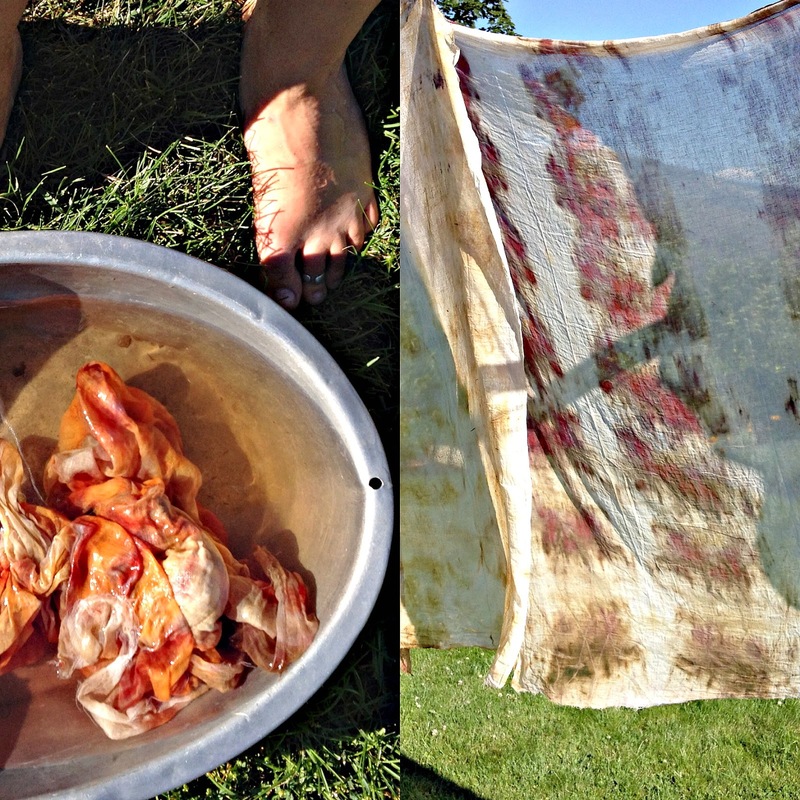 Possibly the most passive way to dye textiles I have ever come across! Lets start at the beginning shall we? 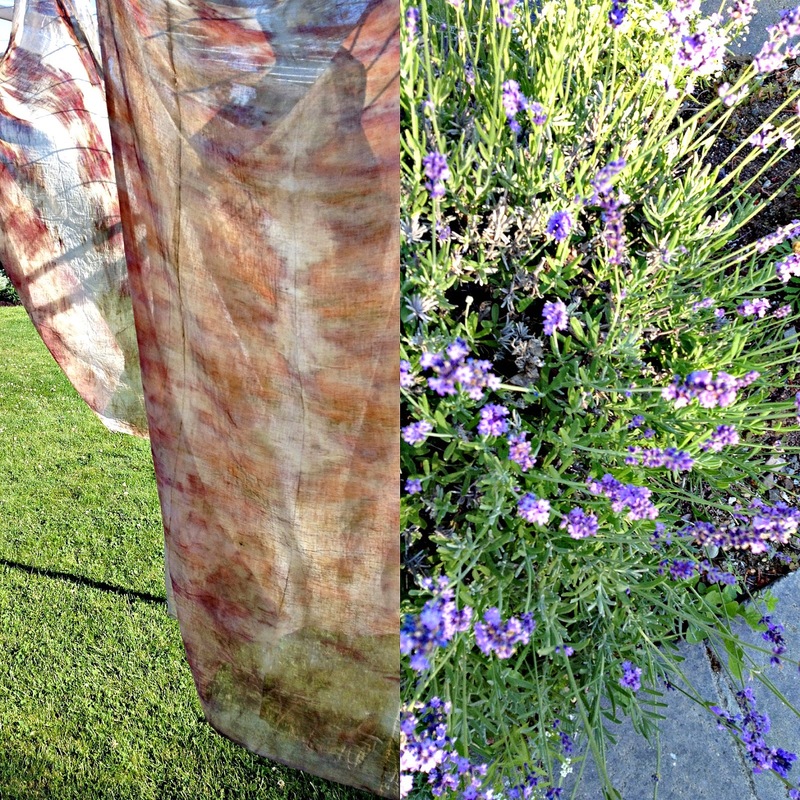 Last week I took a length of lovely organic gauzy cotton and gathered handfuls of plant material from my parent's garden- calendula, marigolds, lavender, hollyhocks, Japanese Maple leaves, mulberry leaves- I even threw in some lavender and dill for flair as I was fairy certain it wouldn't dye but would smell good. I also had a handful of Logwood chips that I wanted to experiment with so I threw those in as well. 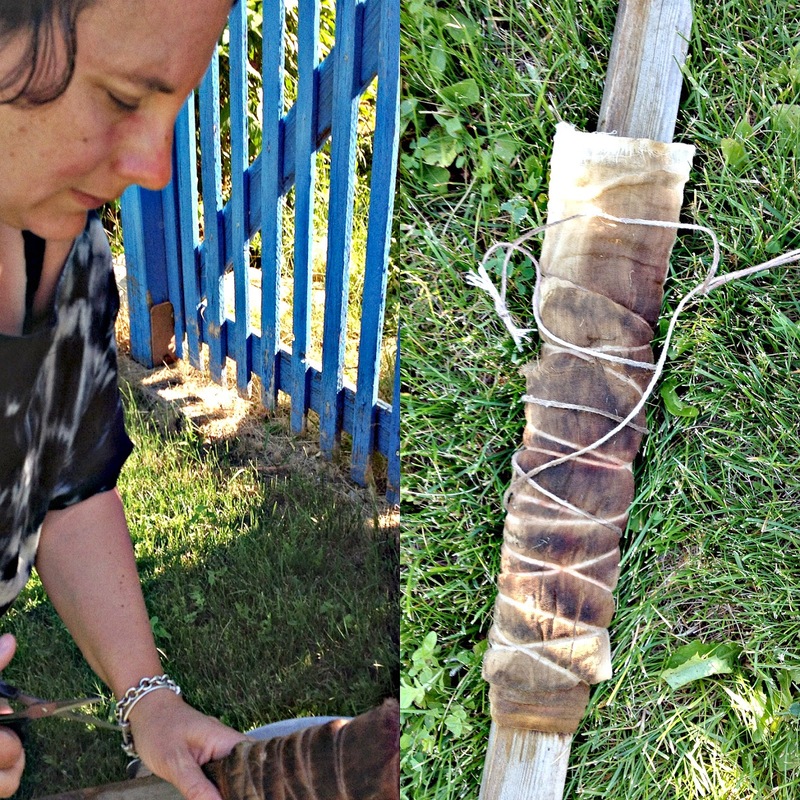 I cut my fabric and folded it accordion style- laying it flat I started to add in the plant material and rolled the whole thing around a stick tightly- tightly trussing the bundles up with butcher's twine at the end. Once fully wrapped I left my bundles at the end of the garden in a spot I knew would get both water and extreme heat- effectively steaming the bundle for the course of the week. It was with great difficulty that I left my bundles at the end of the garden and walked away- I am the sort of artist who likes to poke and pride and hurry things along- this however is one of those beautiful things that can't and won't be rushed- possible life lesson here. I did flip my bundles daily- my Mum taking over that job when we journeyed up to Vernon- but essentially there was nothing I could do but wait and observe with fascination the changing colours on the outside of the bundles- I was dying (haha) to know what was happening on the inside! Needless to say it was with glee that I retrieved my eco bundles from the bottom of the garden yesterday and snipped the butchers twine binding- carefully unrolling these lovely gems of fabric I was beyond excited to see what changes had taken pace over the course of the last week. 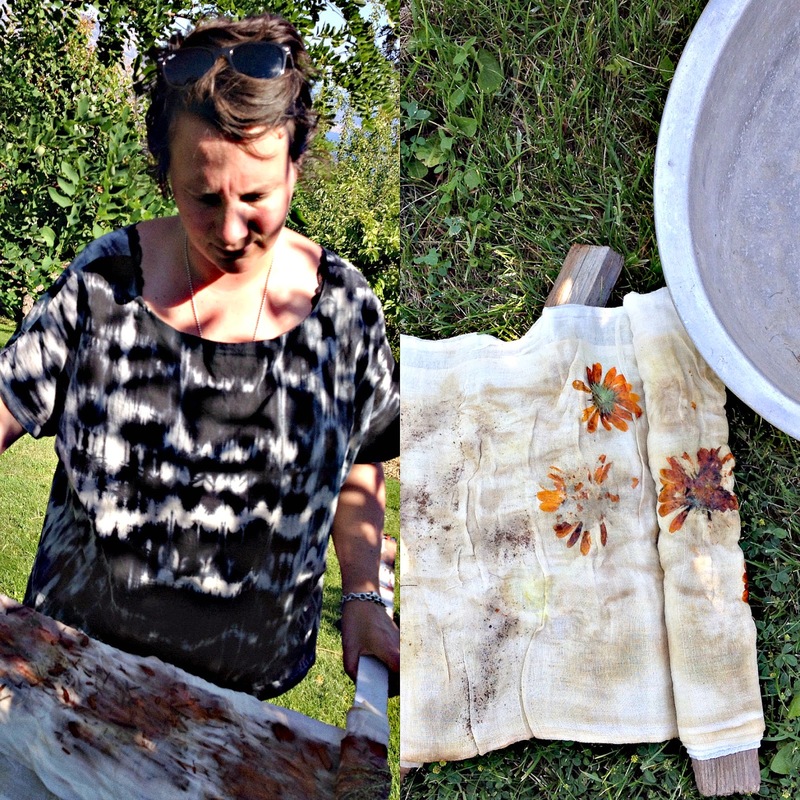 Once all the plant material was washed out I rinsed the fabric until the water ran clear- what was left behind was a lovely sunset of all natural tie dye. I have two large 36" x 36" scarves and one smaller one- it's going to be hard to part with these beauties but keep your eyes peeled for them to go up in the shop next week! This was so satisfying and to be sure something I will do again- I only wish I had brought more fabric this time around! There is really just a quality so ephemeral to these scarves that is difficult to catch onto- definitely the pictures do not do them justice! The beauty of such a slow process- is obvious- something lacking in much of today's busy world. 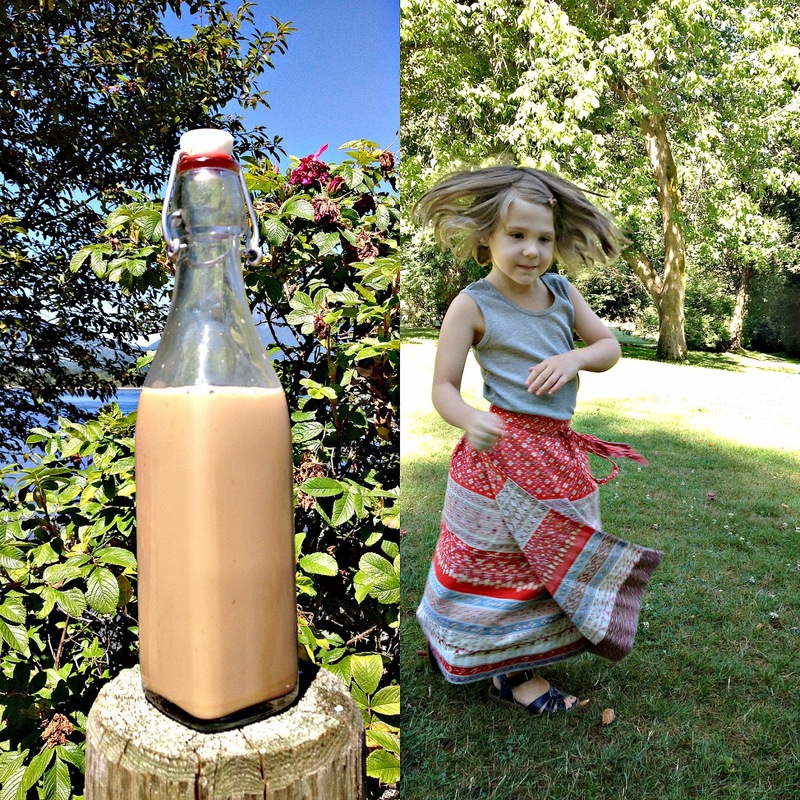 Slow fashion on my summer holiday- yeah that fits just right! We are so happy to be visiting the Okanagan right at the beginning of cherry season- this is the time of year that a random rain storm can either make it or break it for orchardists- currently all we see is blue skis! The fruit is beautiful- and delicious- just as I remember it fresh off the tree. 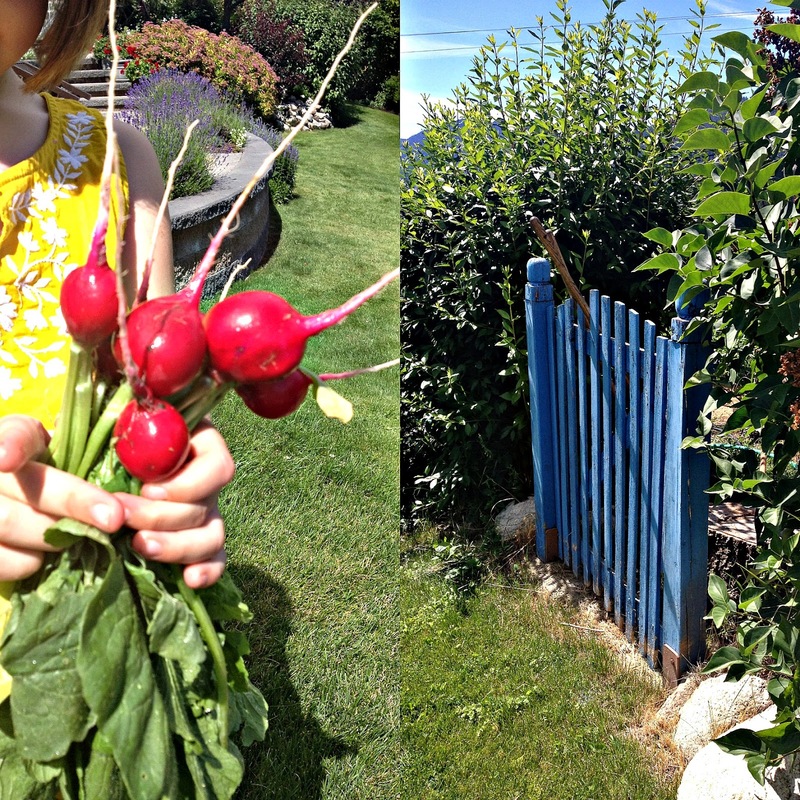 Our Littles are very well versed in where our food comes from- we have planted gardens- pumpkins, carrots, radishes, garlic- we have picked apples in the orchard and plums but never have they picked cherries. There really is nothing quite like eating the fruit right off the tree- still warm from the sun. 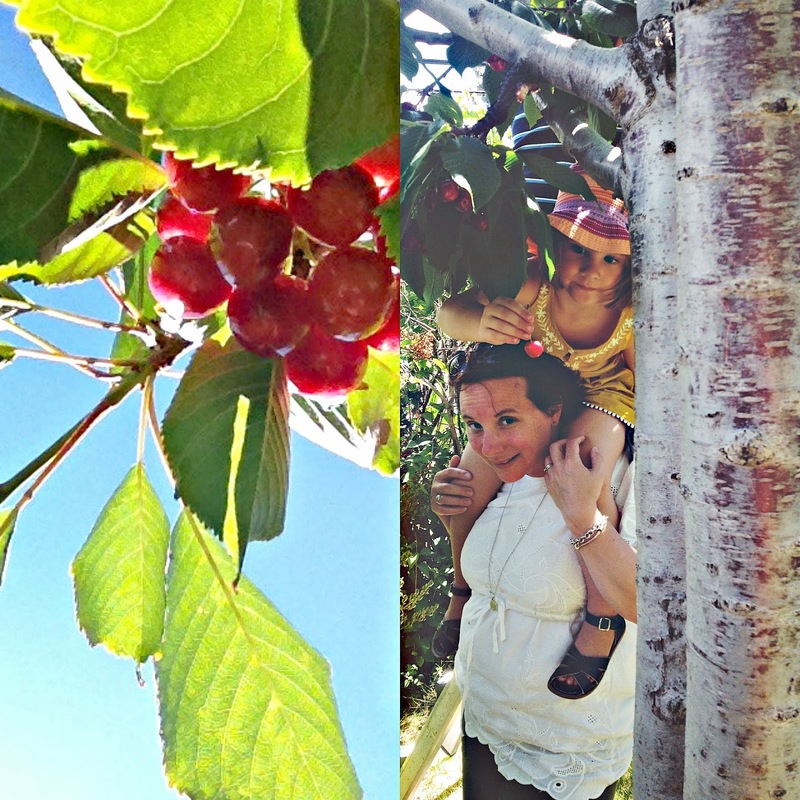 When my sister and I were small we used to head to our Great Aunt's house in Kelowna- as the wife of a former orchardist it was only natural that she have a large and healthy cherry tree sitting on her corner lot. What I remember is how bug that tree was- watching the legs of adults disappear up into the leafy branches- surely up past the telephone lines. Hot, bright skies against the cool, lush, greenery of an ancient garden. My sister and I stealing handfuls of cherries from unattended buckets- hiding out in the dank, dark woodshed with our pilfered treasures- hanging pairs of cherries over our ears - pretending to be grown up ladies. 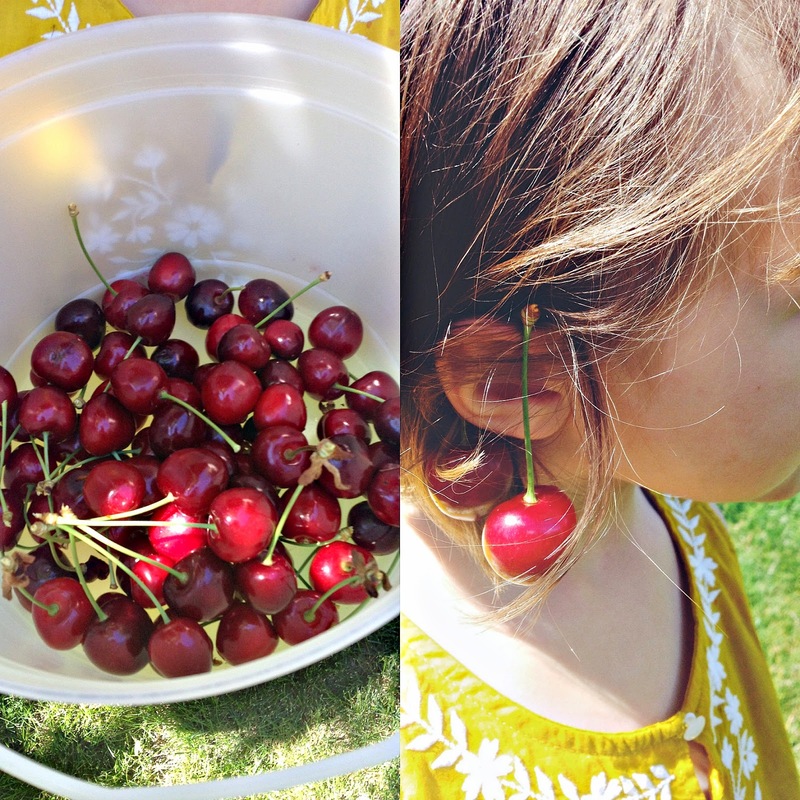 It must be natural for children to hang pairs of cherries over their ears- those dangling pars just beg to be jewels against little one's necks- the best sort of jewellery one could wish for- surely worth more than the largest of rubies. These Okanagan cherries are a symbol of the industry that once drove the Valley- before boats and wineries became the working man's measure of success. 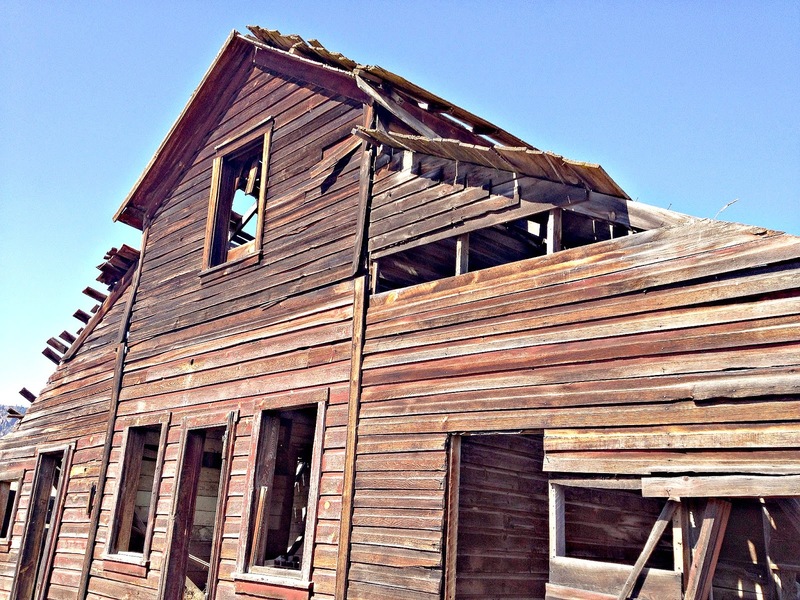 Our children clamber up the ladders like monkeys- perhaps there is some sort of innate memory- my maternal family has a long history with the Valley's orchards. 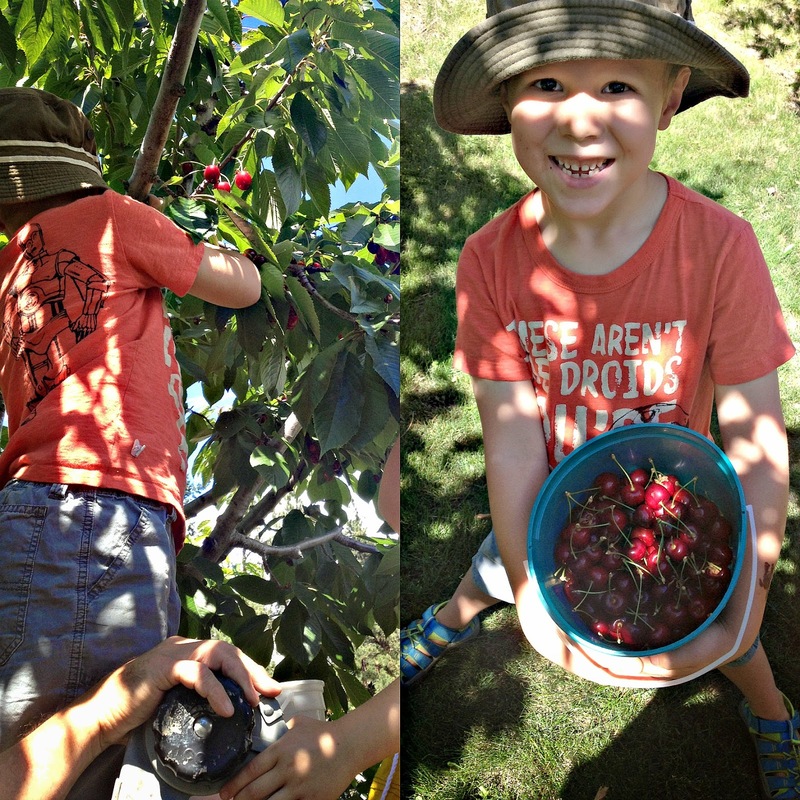 For now what is important to them- on this visit- is not the disappearing orchards of the Okanagan- or the massive spread of condos- or the roar of outboard motors- what is important to these little ones is climbing up a tree and picking the yummiest cherries they have ever eaten. Reaching up to pluck those jewels from the tree and stuffing as many as possible into their mouths! 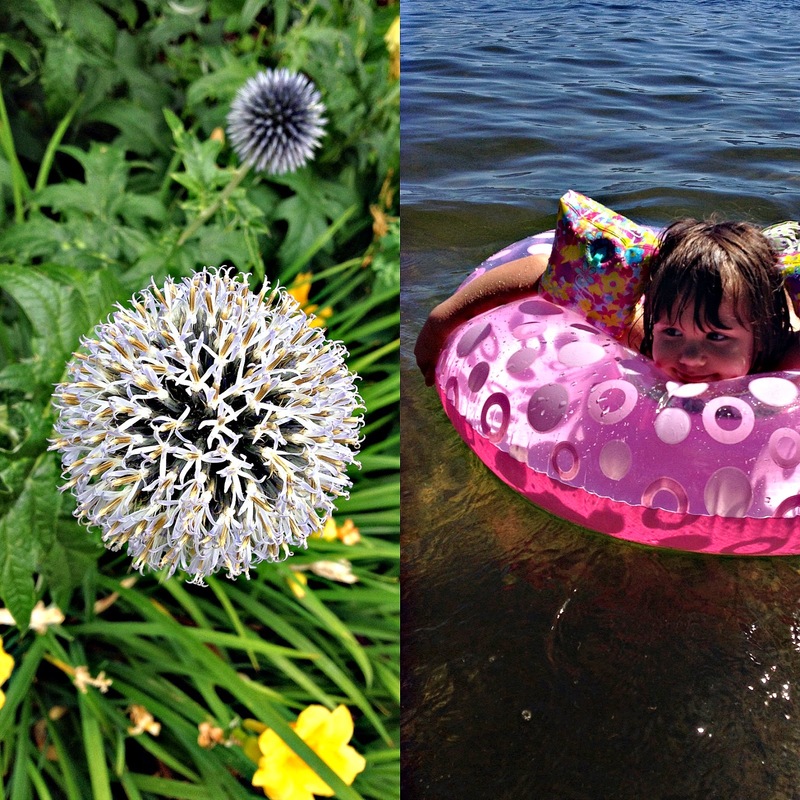 We are wrapping up our first week of vacation in the Okanagan- so far it's exactly what a vacation should be- lots of play time- loads of beach time! 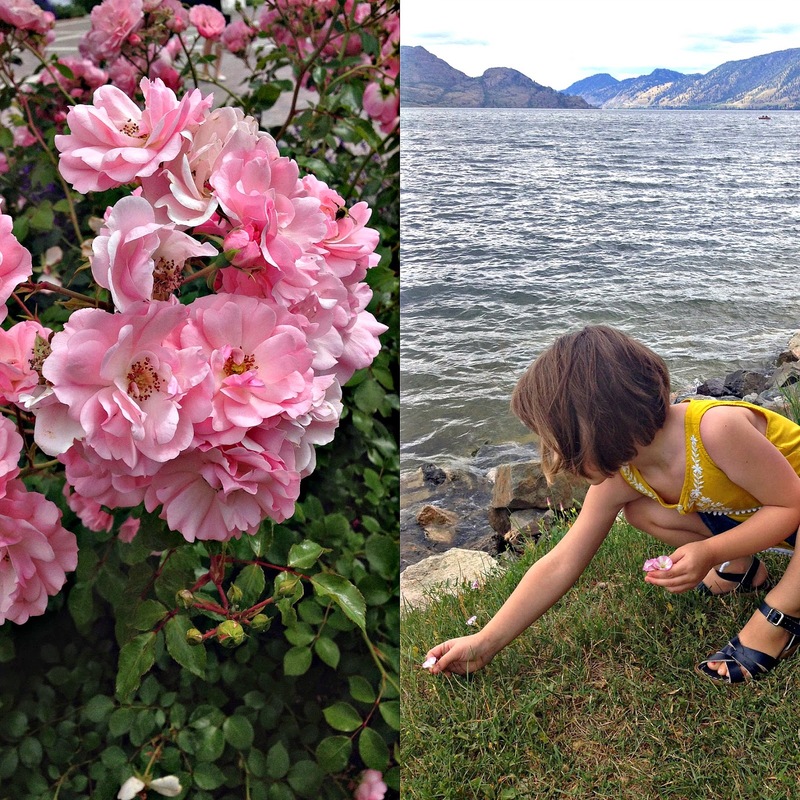 This week has been the kind of week I grew up having- when a kid headed outside at 7:30 in the morning and didn't come back in until after dark- roaming the yard and swimming in the cool waters of Okanagan Lake. Our city kids have already declared they don't want to go home! They are eating cherries from the trees and carrots from the garden- running barefoot and feral as children should in the summer. We celebrated Canada Day in great style with a day at the beach- surrounded by folks we have known forever- ladies who have known me since I was Miss Lo's age- kids I grew up with- now our own children are the ones hopping in and out of the lake- needing endless snacks and drinks while the Mums and Dads relax in lawn chairs- feet dangling in the water. 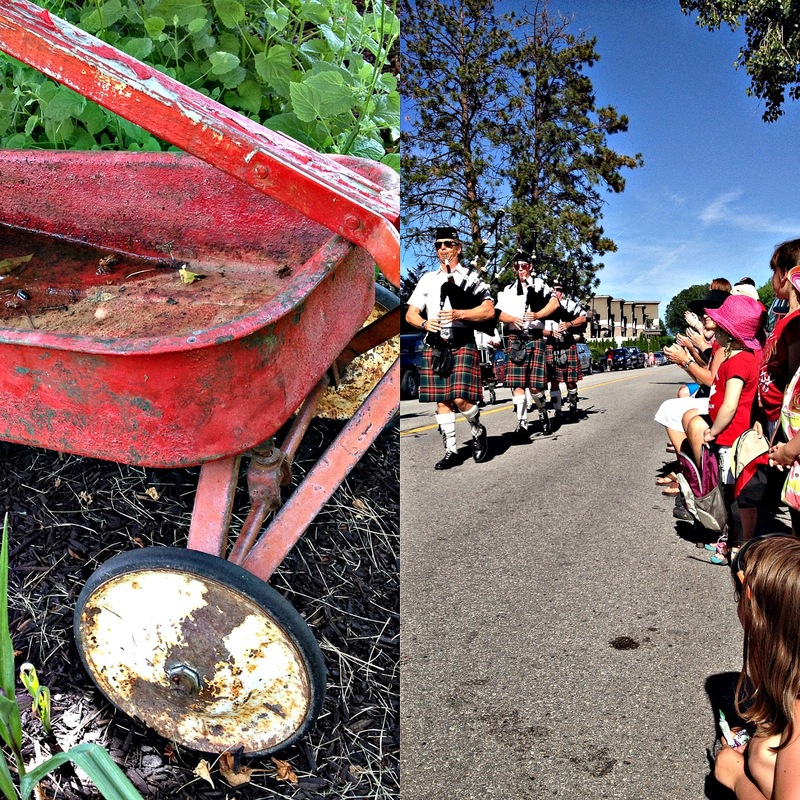 The highlight of the day was an hour long parade- the Littles collected more candy than at Halloween! As evening fell we all retired "up the hill" to my parents house- kids ran wild- a small fire erupted on the BBQ- memories were made. 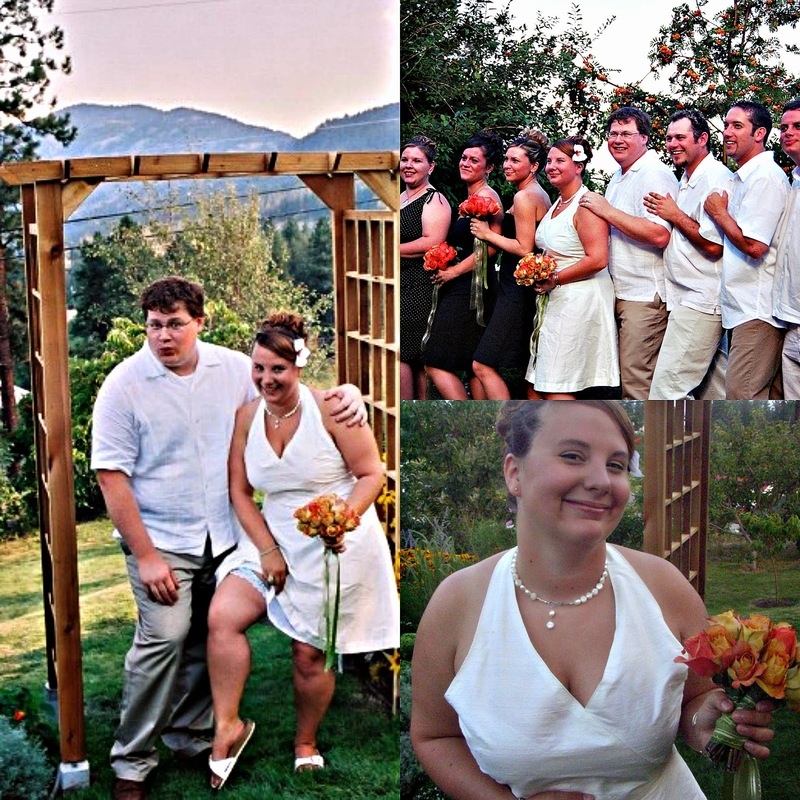 The week has flown by so fast- it's difficult to reconcile all we have witnessed- including our sweet niece's wedding in her parent's back yard- such love and happiness. We have said "see yah later" to Peachland and are in the North of the Valley at Omi's house in Vernon- more swimming and lots of World Cup action! I think what makes this trip so different is the pace we are setting ourselves- no hurry to see everyone and do everything all at once. 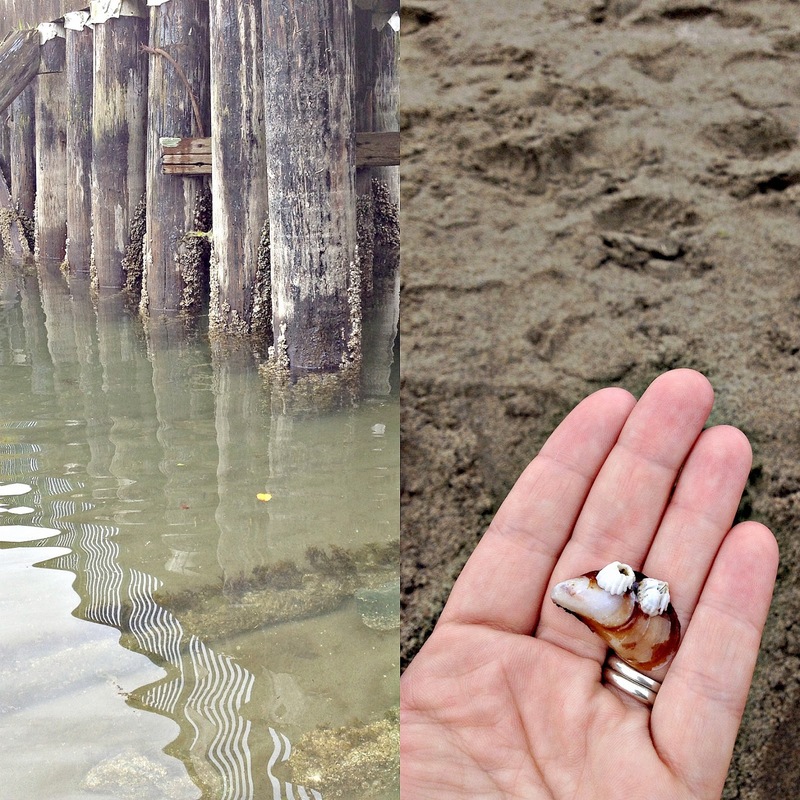 We still have a week left to go- more adventures- new beaches and of course more Farmer's Markets! Dear Friends it is Friday- the week- it turns out- goes just as fast when a person is vacationing than when they are at home facing the daily grind! With only nine more days to go we are going to keep it slow and savour as much of our time here as possible- this weekend I'm sure will hold more visits with friends- babies- puppies- all that good stuff! Happy Friday Friends! I can't believe after all of the Farmer's Market Missives that I have posted here over the past few years I have yet to write about the Sunday market in Peachland. 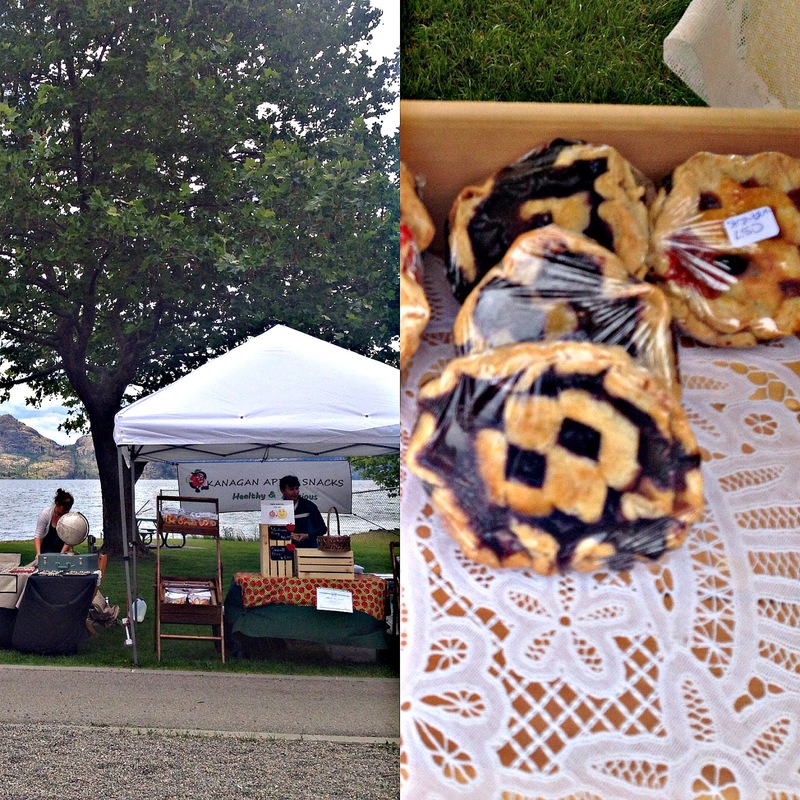 Located at Heritage Park right in the heart of the downtown core the Sunday market really attracts the crowds- locals and visitors alike gather between 10:00 and 2:00 to enjoy music, local foods and crafts on the shores of Okanagan Lake. While the market tends to run a bit heavy on the jewellery and a bit light on the fresh produce- there are plenty of bakers and makers to provide local, yummy treats. Of course being the Okanagan apple product abound in the form of juice and apple chips- fresh apples are not to be seen for another few months. Strawberries and Cherries are the fruits of choice in season right now- Peaches also being a few weeks off. Unlike the markets in Vancouver "organic" is not posted at every vendor stall you come across- only one certified organic vendor was in attendance and their prices were really reasonable- I wonder why everyone isn't buying their kale and lettuce at the Peachland Market! The Farmers Market in Peachland really only got going after I moved to Vancouver- I have to say that it's pretty impressive to see this kind of gathering- a bit of a tourist draw along the lines of the markets on Saltspring or Pender Islands. Still amongst the tourists it was fun to see familiar old faces from my days of working at the marina- which is right next door to the market. It's so nice to see this hustle and bustle in the downtown core of this little town I am proud to be from- off the highway and down by the lake is a handful of little gems- including the market. Often people- ourselves included- whizz right by these turn offs never knowing what lays beyond the highway exit. 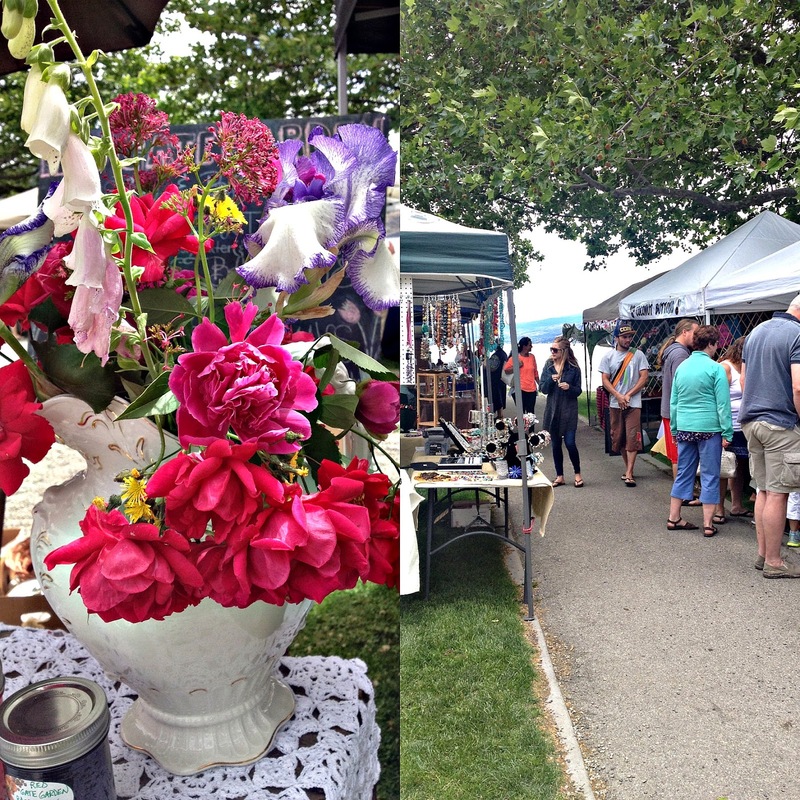 I would definitely recommend the Peachland Farmer's Market on Sundays as a fun little outing- grab a coffee before hand as there is no coffee cart on site- and wander the waterfront walkway! 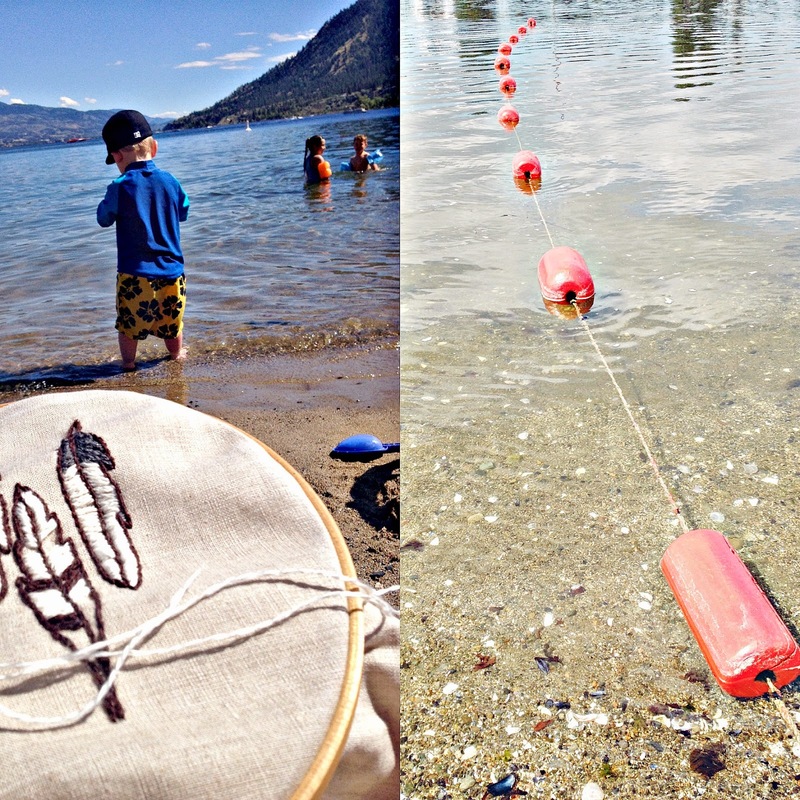 P.S.- Happy Canada Day to all my fellow Canadians near and afar- today we will be hitting the beach again- Peachland puts on a stellar parade be sure tomorrow's post will be full of parade related pictures!